2016 has been a year of tremendous struggle. Big things and little things alike have not gone as planned. It has been a challenge to understand why and how people can be so searingly hostile to both the planet as well as to each other. But, all of this is not meant to be understood. Endeavoring to understand or rationalize our current circumstance serves as a distraction that not only misuses time, but also generates anguish. Our present conditions are a call to action, but along with the donations we make and the volunteer work we do, we must not neglect the inner world that ultimately frames our external experience. Nurture inner peace. It is the simplest and most effective form of dissent. Only when we have quieted our minds and pacified our broken hearts, can we find the compassion it requires to move beyond diversion and find common ground. When it seems the flame within your soul has gone out, take a deep breath, and light another match. Tucked away on Jl. 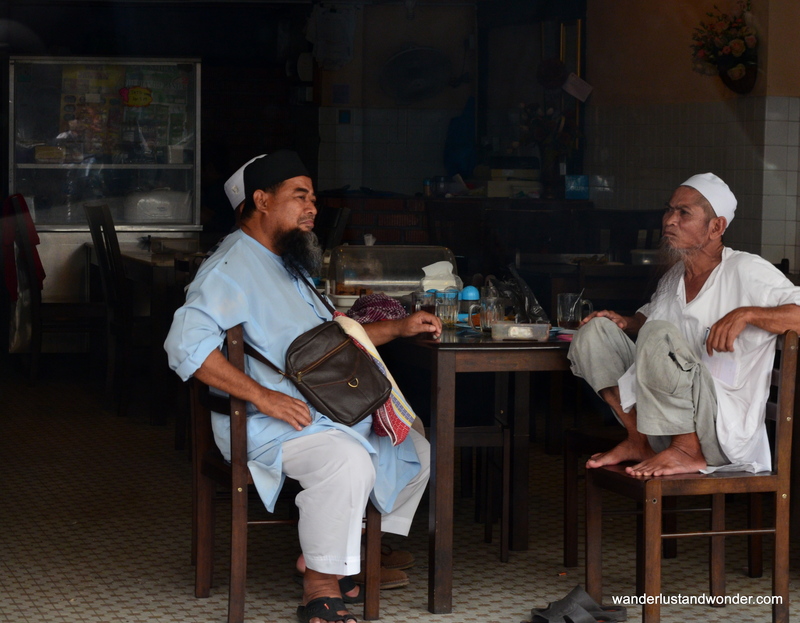 Lorong Burhanuddin Helmi, nestled behind a charming turquoise gate, sits a quiet jewelry studio where bohemian treasures abound. Inside Aini and Martin’s studio. 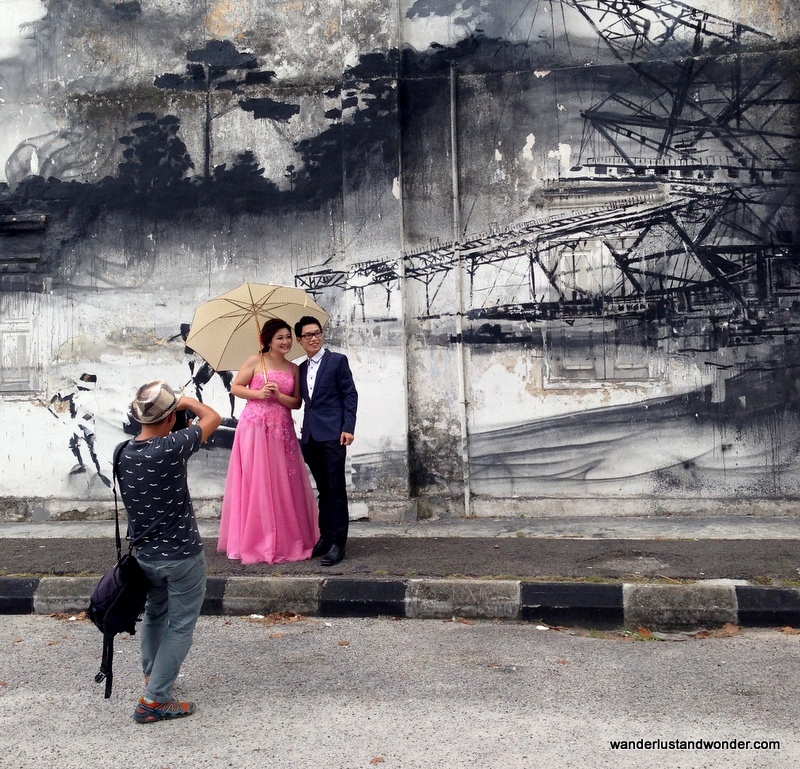 The space is the brainchild of Aini Aili and Martin Naf. It seems fate brought these kindred spirits together as Aini Ali had an interest in pursuing metalsmithing yet found herself frustrated with how difficult it was to find a teacher. No sooner had she relayed her vexation to her boyfriend than she met Martin Naf, an artisan with over 30 years of experience in the trade. The two hit it off immediately and have been working side-by-side ever since. This year the duo opened up their own studio space where they can nurture the collaborative nature of their partnership while working independently. Their individual designs complement each other and give their customers a vast and beautiful assortment of one-of-a-kind trinkets to choose from. Aini’s work is striking yet feminine. Drawing inspiration from her surroundings and their associated energies, cultures, emotions, and experiences, her work is imbued with detail and meaning. I especially love how many of the details in her work are apparent only to the wearer of the piece. Her work traverses simple adornment, serving instead as the kind of keepsake you adore for a lifetime. The back of this ring features a delicate petal motif. Another thoughtful detail by Aini. Martin’s unique and unparalleled skill set comes across in every piece he crafts. Everything is done by hand, including the making of the sheet metal the pair employs. Taking this extra step ensures that the quality of the silver they use remains unquestionably high. The resulting rings, pendants, and bracelets have an organic feel and tribal aesthetic. Martin Naf melting down metal. Travel has served as a muse for Martin, who has ventured all over the globe selling his jewelry and teaching others his craft along the way. His work is steeped in rich texture and often features the alluring gemstones he’s collected abroad. A pendant by Martin Naf. In the studio with Martin Naf. Both artisans have an unwavering passion for making incredible pieces that are also wholly affordable. With today’s emphasis on buying local and supporting homegrown artisans, there is really no need to purchase something that comes in a Tiffany blue box, when something absolutely special can be found behind a turquoise gate. I think Frida Kahlo would agree. 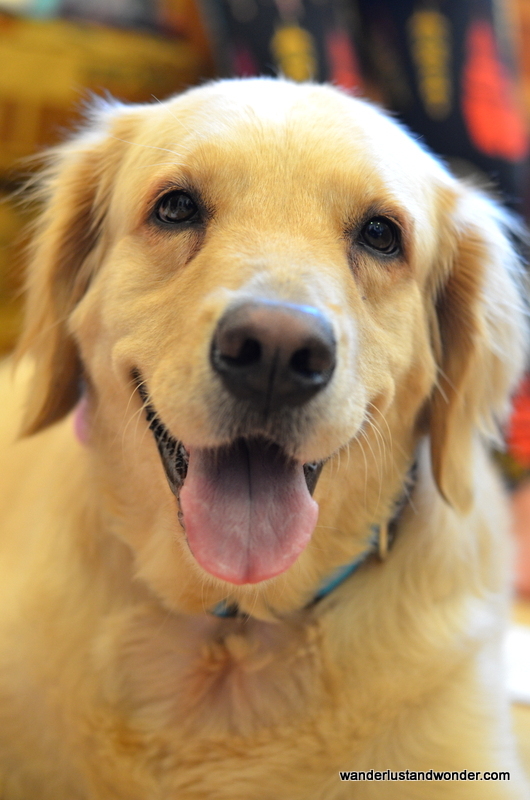 As we near the end of our time in Malaysia it became necessary to ship our wonderful Golden Retriever back to the homeland. The process of figuring out which routes were best and which company to use was arduous. Flossy is a ball of nerves when it comes to traveling. A 45 minute car ride stresses her out, so the prospect of sending her across the globe was a source of much anxiety. We wanted her to have a safe and comfortable journey, but needed to keep costs reasonable as well. Thankfully, I can now happily say that Flossy is safe and sound in the U.S. keeping my mom company until we can once again be reunited. Bearing in mind that this is my experience and the information I’m sharing is accurate to the best of my knowledge, here is what I learned along the way. 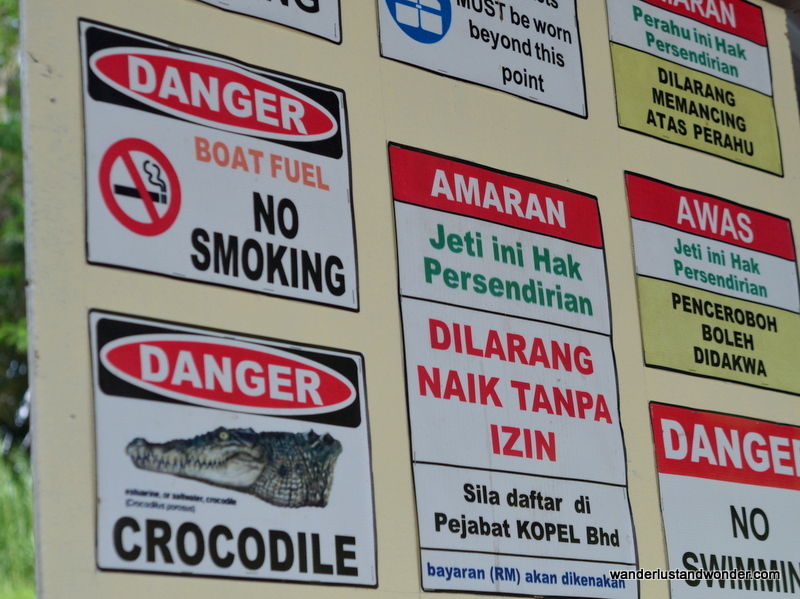 Kuala Lumpur International Airport (KLIA) does not allow pets on the premises. So traveling with Flossy was not an option. Also heat restrictions prohibit the shipment of pets out of KL from May 15-September 15, and made it necessary for us to ship Flossy a few weeks ahead of our summer travel dates. 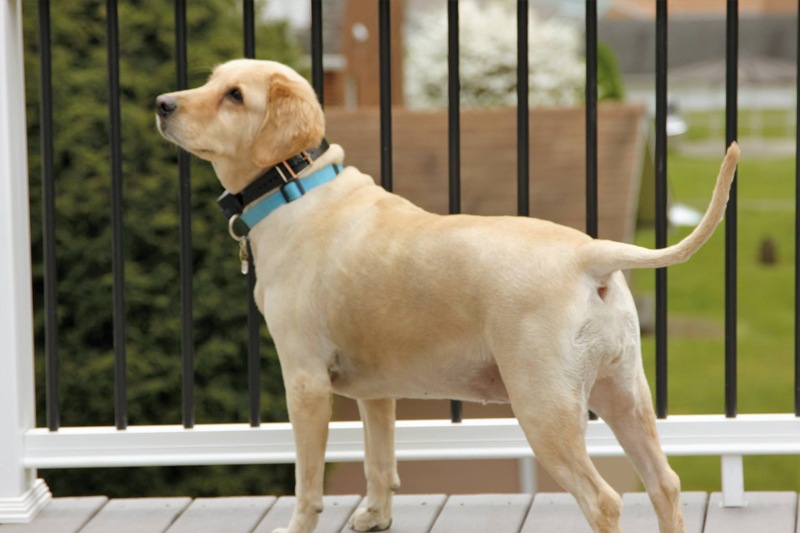 Furthermore, certain paperwork can only be executed by a pet agent, so there is really no getting around hiring someone to assist you with the process. I emailed each and found all to be responsive. I asked for a price quote as well as some general questions concerning which route would be best for Flossy. 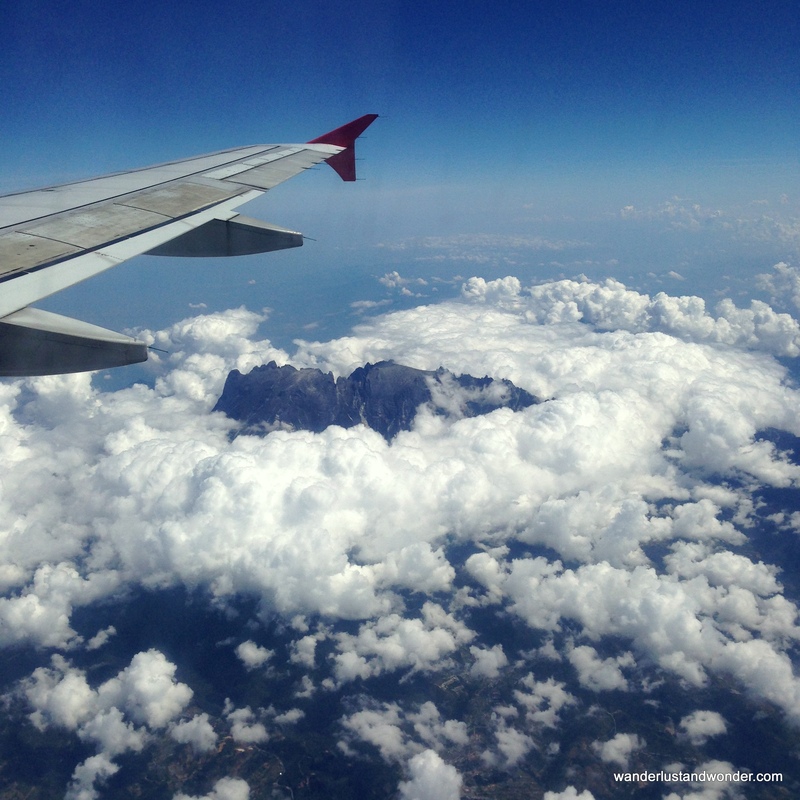 When researching online, I found that routes through Amsterdam and Doha were recommended. Dr. Sockalingam was the only one to answer my questions thoroughly, and his price quote was several thousand ringgit cheaper than the others as well. Dr. Sockalingam explained that flying Flossy through Doha would be a great option as the cost of her ticket would stay low, while the quality of her care would remain high. Of course I researched this online and called the cargo department of Qatar Airways in Doha directly to make sure that she would in fact be in caring hands for the duration of her trip. The airline associate that I spoke with was friendly and professional. She explained that Qatar Airways’ facilities in Doha include a temperature controlled holding area where food and water is provided hourly (up to two hours before their flight), as well as a vet on hand who checks on each animal, and they clean the animal’s crate before the flight. All of this was very reassuring to hear. The journey ahead seemed daunting. Dr. Sockalingam came to our place a couple of weeks prior to her scheduled departure date to give Flossy a check-up and make sure her paperwork was in order. Flossy instantly took to him. I think she would have left with him if I would have let her! Since Flossy was already microchipped and all of her vaccinations were up to date she was good to go! I attached two water dispensers to her crate along with a bowl for holding her food. 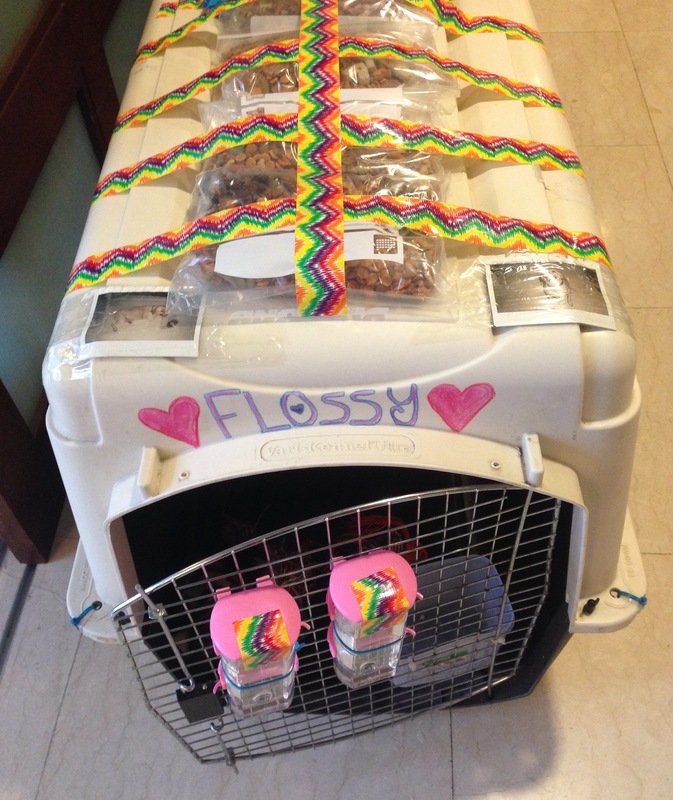 Since her journey to Washington, D.C. was going to be a long one, I duct taped four individually zip locked portions of food (with treats inside buried in the mix) to the top of her crate. I also decorated the front of her crate with her name. I wanted her handlers to know her name in hopes that it might comfort her along the way. According to my mom, when Flossy arrived in Dulles everyone around her was calling her by name and she was wagging her tail right and left! I took two Polaroid pics of her and inserted them in Ziploc bags and taped them to the front of her crate. In the unlikely event that she escaped from her crate (you read some harrowing stories online!) people would know her name/what she looked like. Finally, I placed a towel in Flossy’s crate to remind her of home and hopefully increase her sense of well-being. 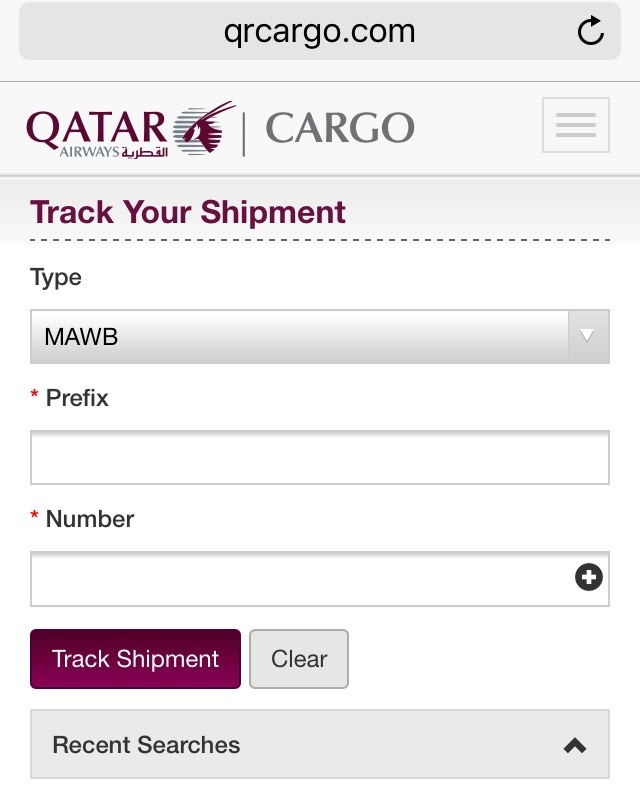 Qatar Airways Cargo Tracking allows you to track your air cargo online. 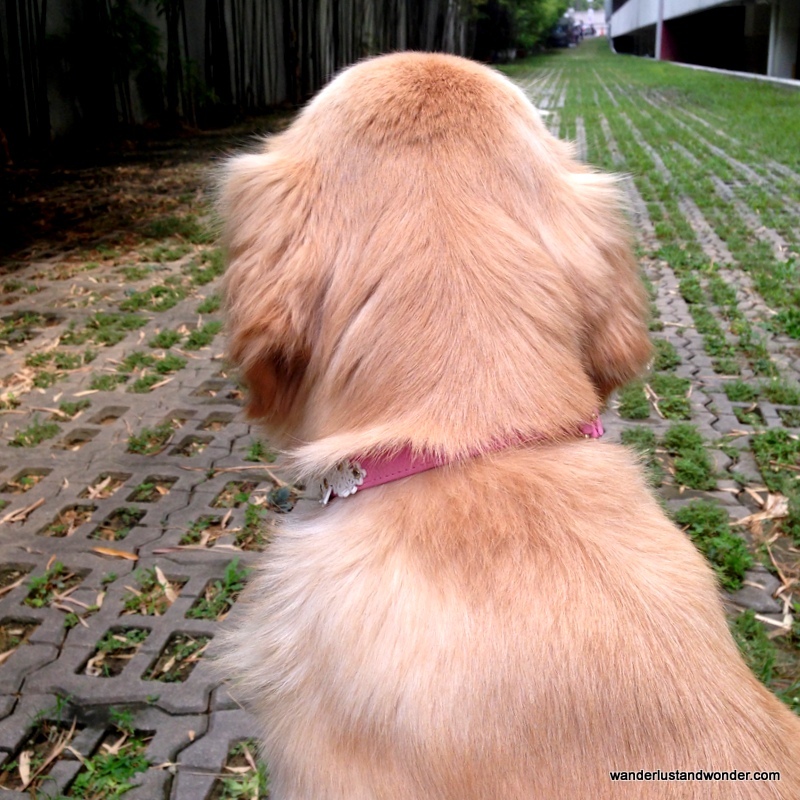 I followed Flossy’s itinerary and saw she was on schedule for each of her flights. Air Cargo tracking provides peace of mind. It was a nerve-racking couple of days as I sat waiting to hear that Flossy had indeed arrived safely. Flossy arrived in Dulles happy and surprisingly clean. As it turns out she wasn’t nearly as stressed out as I was! Thanks to Dr. Sockalingam her trip was a complete success. Flossy is now enjoying her temporary new digs in the U.S.A. Thanks Mom! 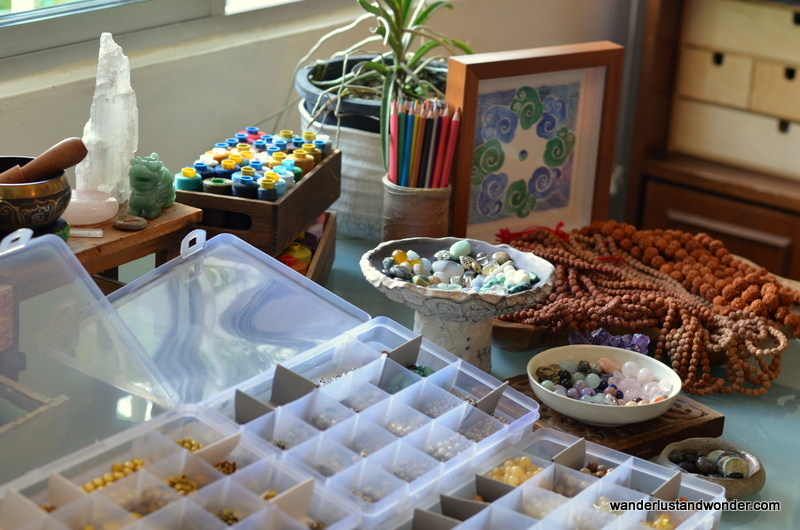 Looking to do something unique and creative with my daughter Ava, I signed us up for a mala making class with Jiawen Loo. Jiawen is the owner and creative force behind Moolamala. 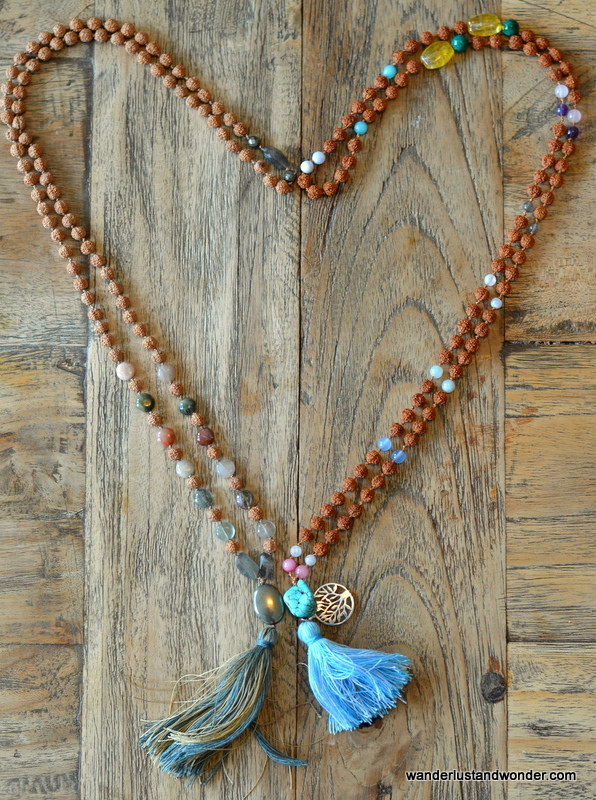 In addition to leading mala workshops, she makes beautiful intention-driven jewelry. 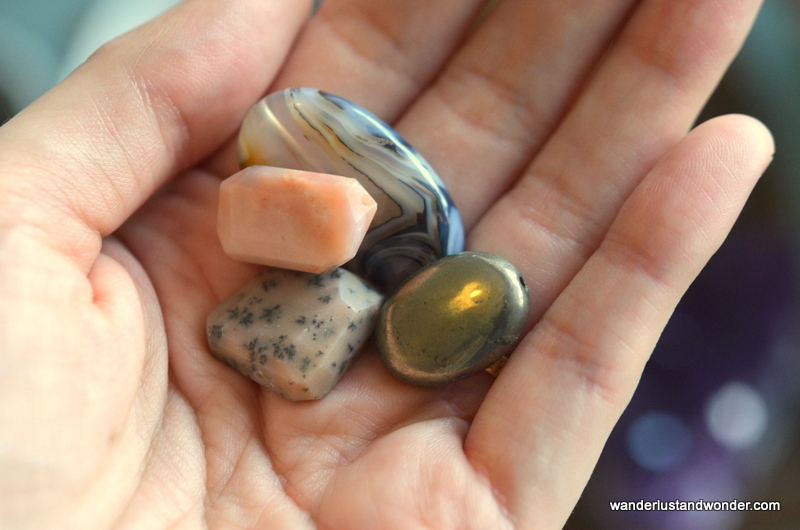 I love natural rocks and gemstones, as well as making things by hand. Luckily Ava does too, so the two of us were excited to learn the craft of mala making. 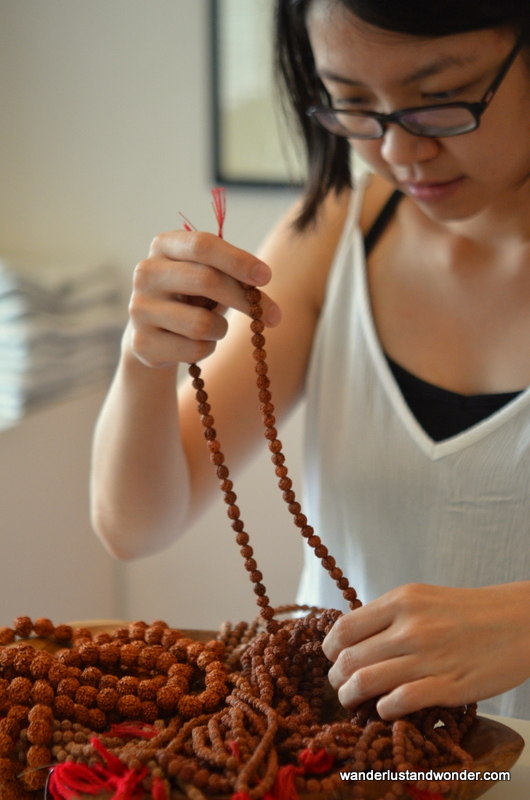 Fellow student Khim selecting her rudraksha beads. 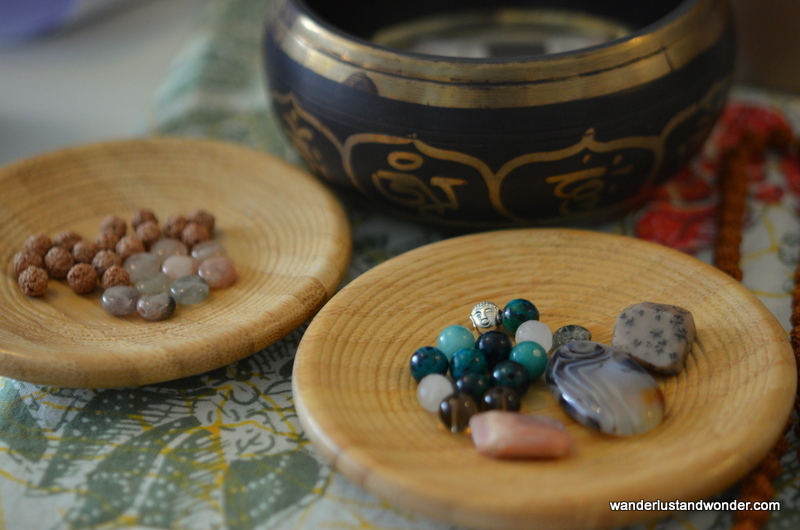 Malas are essentially a tool used in meditation or prayer. 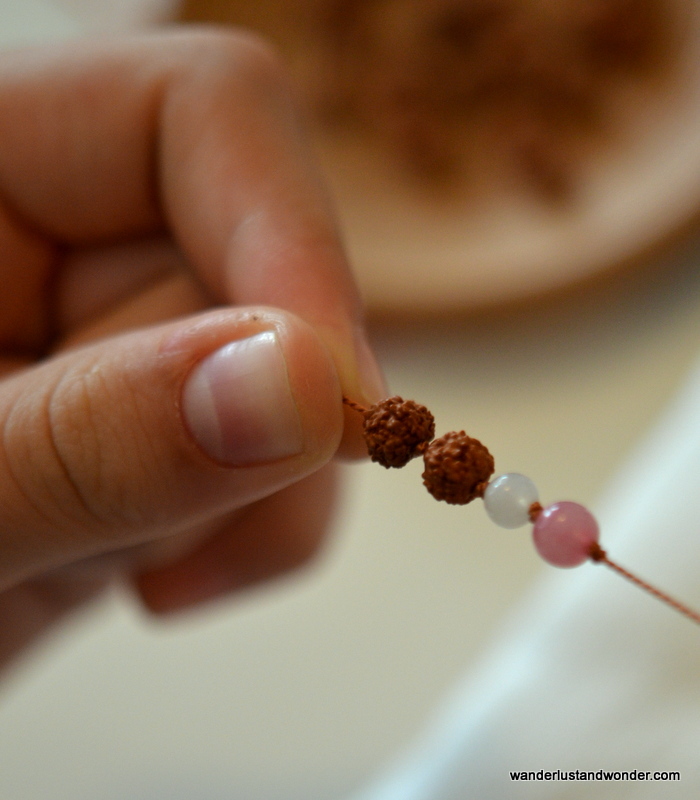 For Buddhists, with each of the approximately 108 beads in the mala you repeat your mantra. Personally, when I meditate I don’t use a mala, but I do find them useful as a daily reminder to stay present and engaged in the now. This is what I hoped to encourage in Ava. 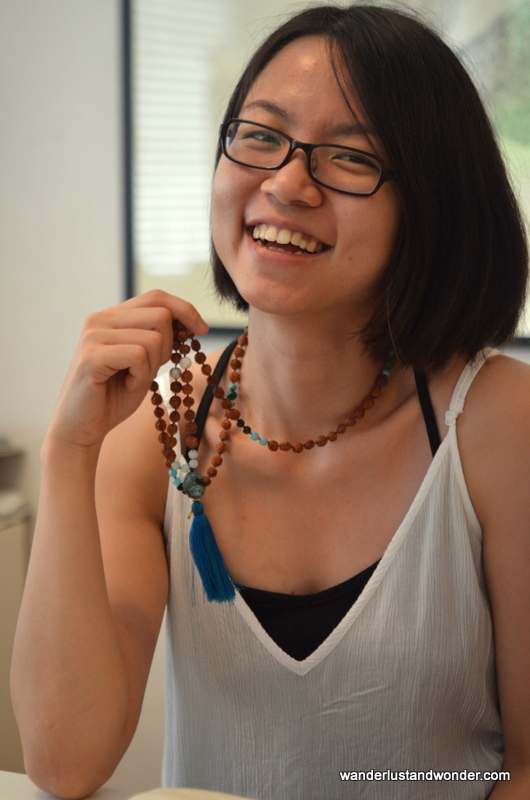 Khim with her beautiful mala. Mala making takes time and patience. Fortunately Jiawen is the perfect teacher for this task, as she is as gentle and serene as they come. She demonstrated how to go about tying each tiny knot with humor and grace. Jiawen demonstrating how to tie the knots. We began by taking a few moments to write down our intention in making the piece. 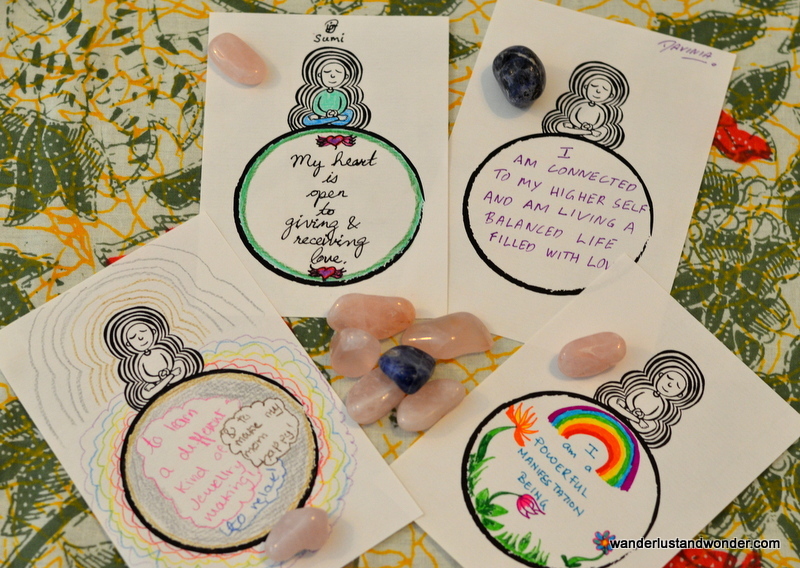 By writing down a personal affirmation and remaining centered on it throughout the process, it becomes a part of the mala much like the beads themselves. 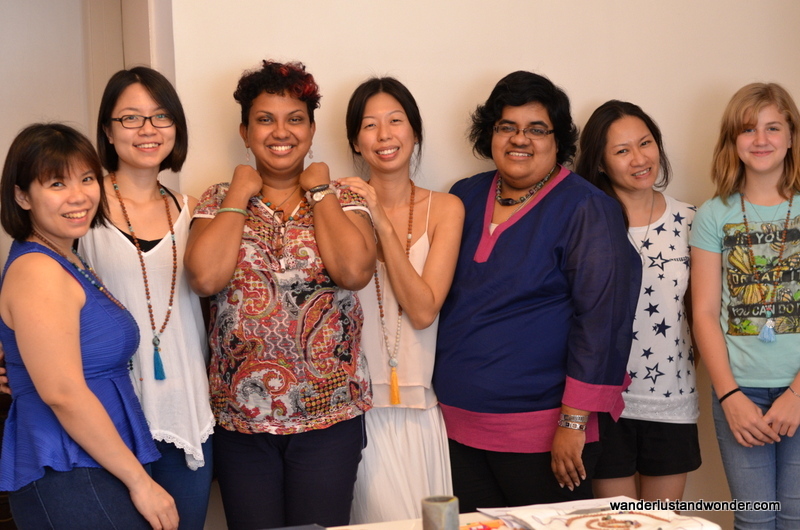 After penning our intentions, we got down to the business of crafting our malas. 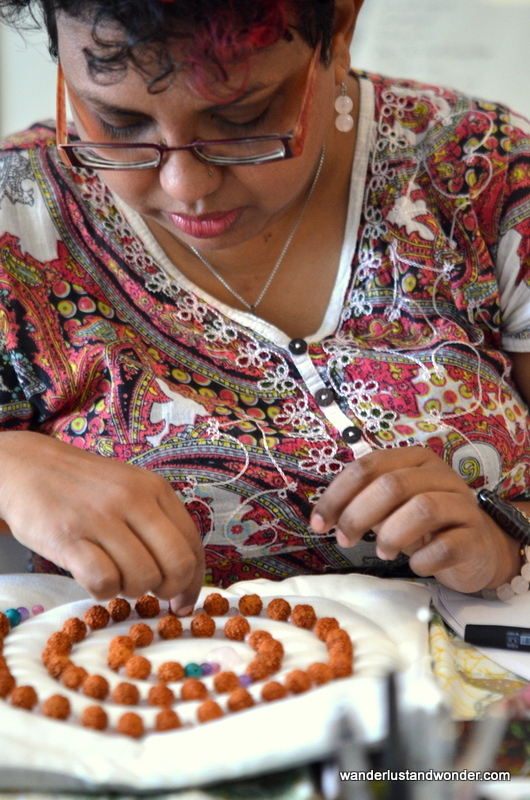 Fellow student Sumitra organizing her beads. 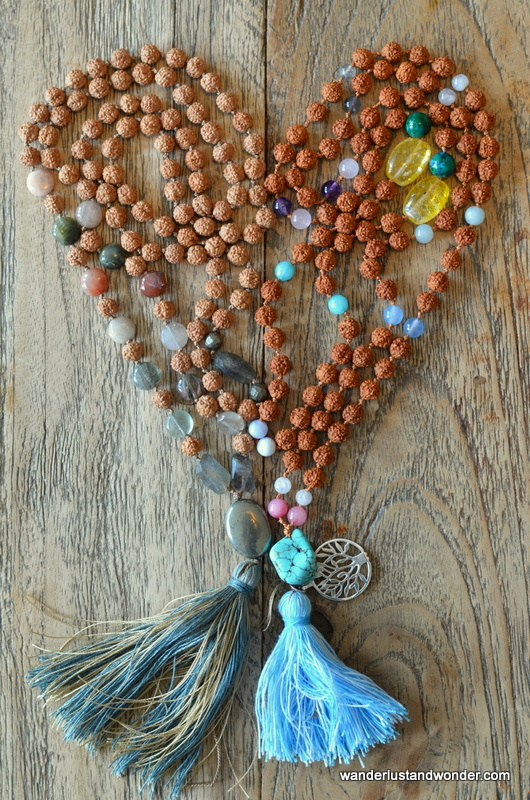 Our malas were based around a string of rudraksha beads, with gemstone accents and the guru bead selected by each student. When faced with a beautiful buffet of gemstones, I had the hardest time deciding which ones to choose. Jiawen reminded me that my first mala need not be too precious and that I should just begin with one color and see where it leads. To whittle down my choices, I called to mind one of my favorite landscapes and let that guide my color choice. 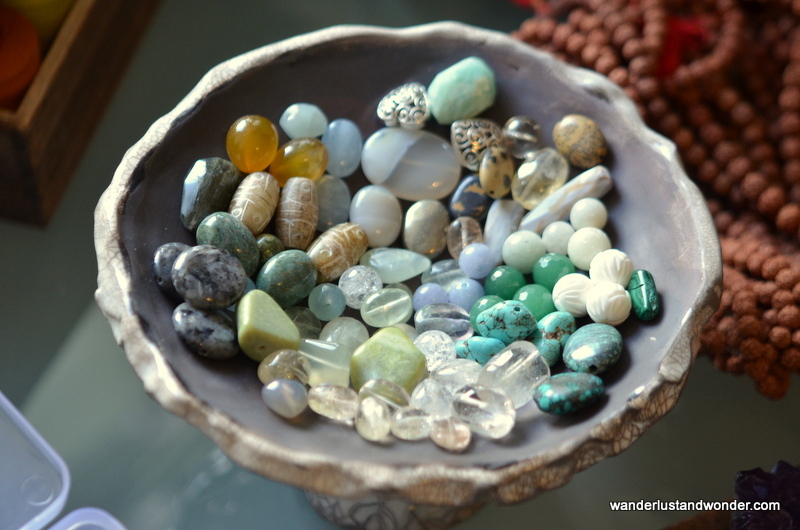 For me the desert always inspires a sense of peace and purpose, thus I selected muted and earthy toned stones, with a larger pyrite bead for my guru bead. So many beauties to choose from! This is my kind of candy bowl. Ava took to the process with little direction. She’s always had a gift for choosing an unexpectedly beautiful color scheme. Whether it be for a picture she’s drawing or decorating her room, she definitely doesn’t have my decision-making paralysis! This is the color palette I decided on. It took the two of us about 5 hours to complete our creations. Ava was elated with how hers turned out. The bright pink, yellow, and turquoise stones really matched her sanguine personality. I was really pleased with the outcome of mine as well. With Jiawen’s guidance my knots were tight and even, and while my mala was not entirely perfect (somehow my center bead ended up not centered), it was definitely perfect for me. The urban jungle had been taking a heavy toll of late. 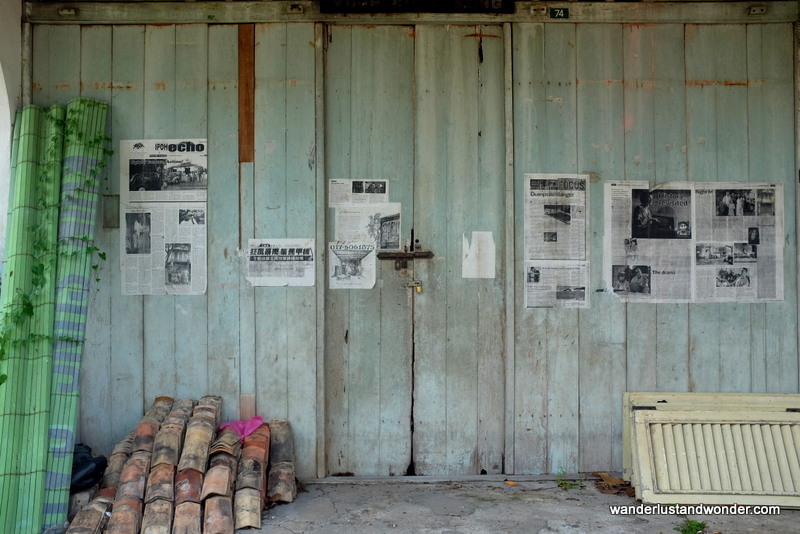 Wanting to get away from KL’s traffic and haze we headed to a place we fell in love with last year during the Rhythms of Rimba Festival–Sandakan. 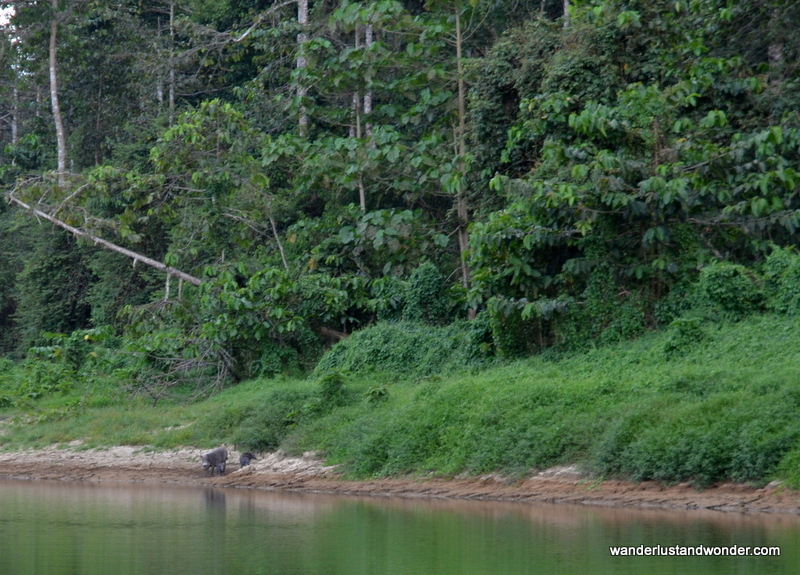 Three hours away by airplane, Sandakan is a sleepy town where nature abounds and tranquility prevails. 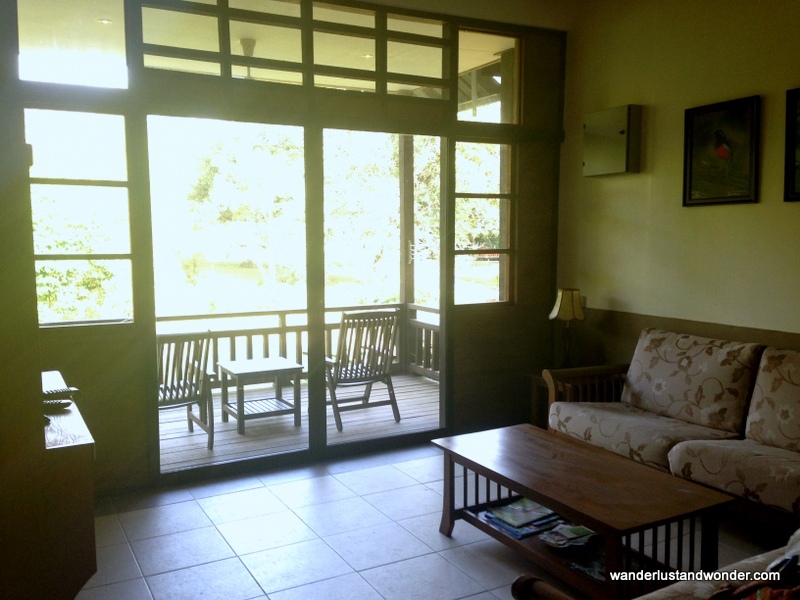 We started our trip at the Sepilok B & B, which is a lovely place to decompress and enjoy nature. The accommodations are very basic, but also spacious and clean. 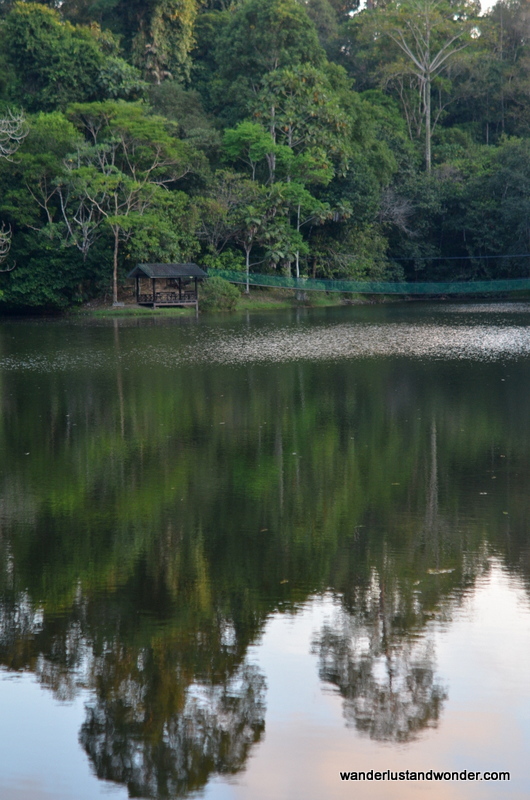 The Pitta Lodge easily accommodated our family of five with two bedrooms, a living room, balcony and small kitchen. I love falling asleep (and waking up) to the sounds of nature, and that’s exactly what you can do here. The food is also very tasty and the staff extremely warm and friendly. We truly enjoyed our time there. 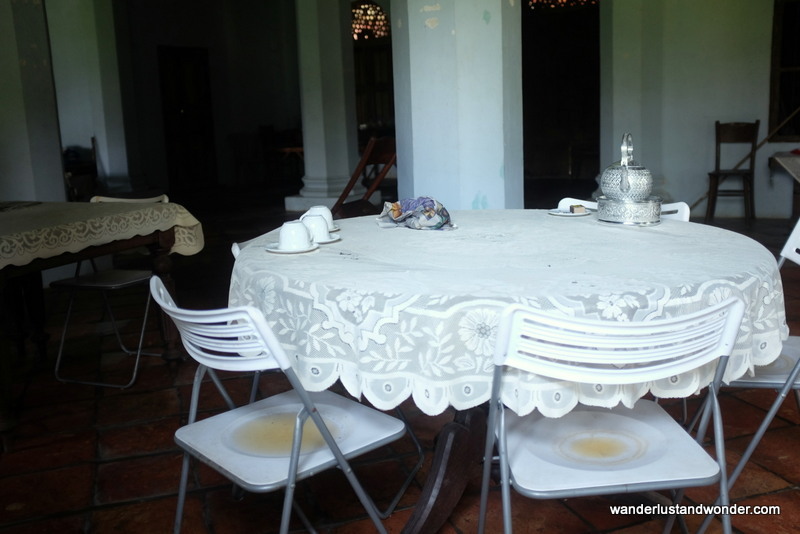 Another advantage to staying at the Sepilok B & B is that is close to several attractions. 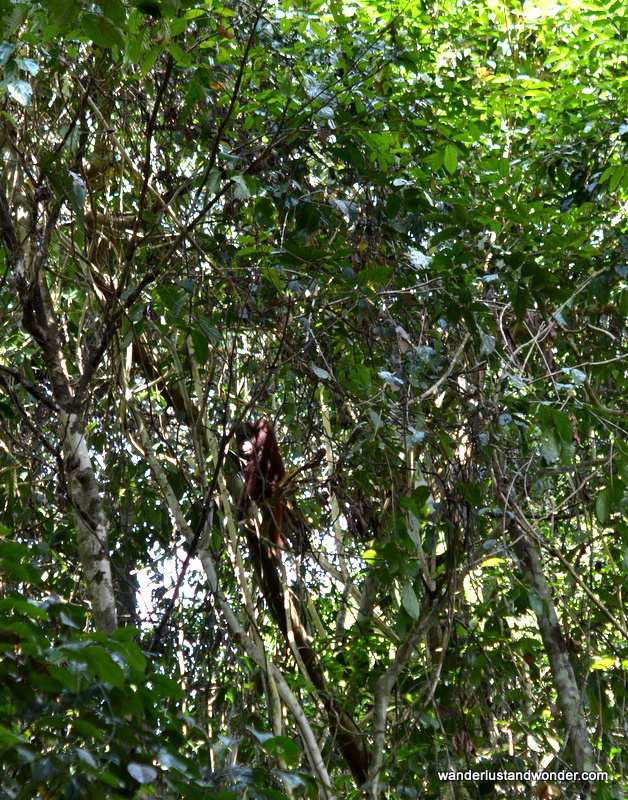 The Rainforest Discovery Centre is within walking distance and is a great place for bird watching. Guided tours are available. 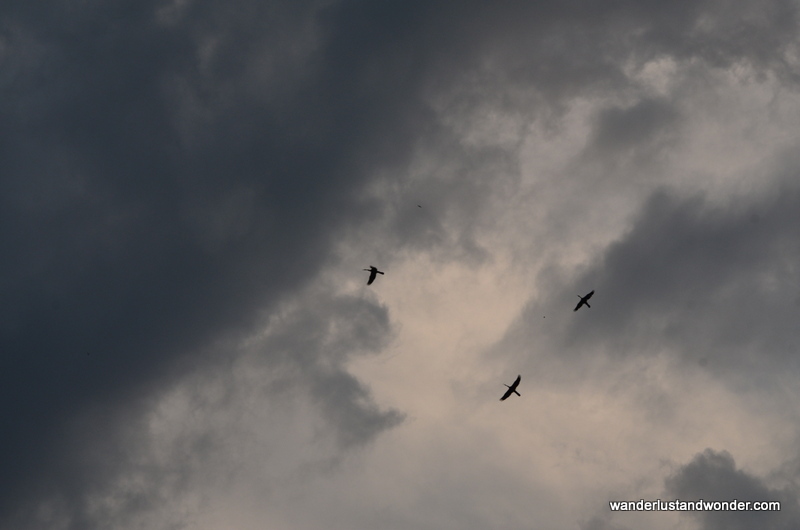 At dusk we headed to the observation point and spotted a flying squirrel. These monkey-sized squirrels climb to the treetops and essentially base jump down, which is a spectacular thing to behold. 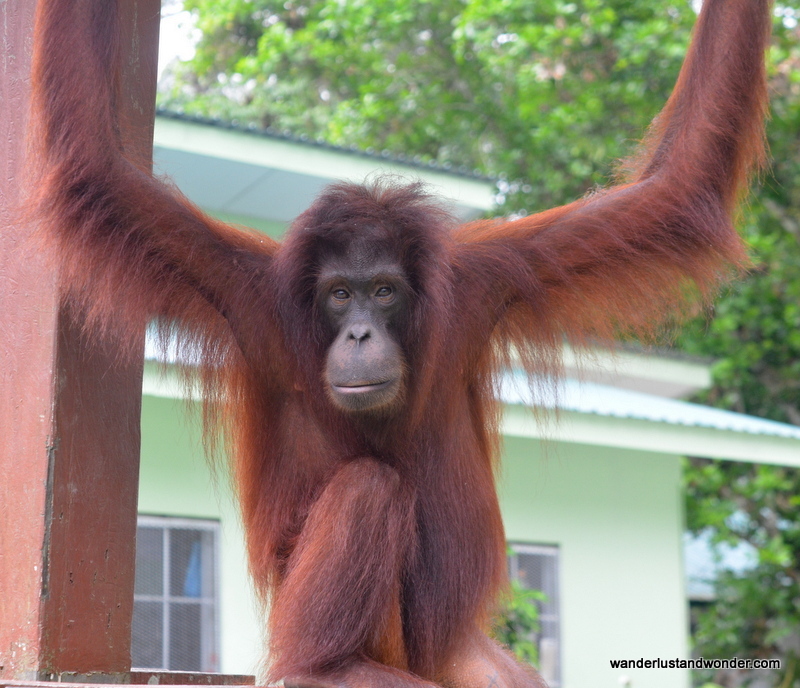 The Bornean Sun Bear Conservation Centre and Seplilok Orangutan Rehabilitation Centre are adjacent destinations that are a short (and traffic-free!) car ride away. 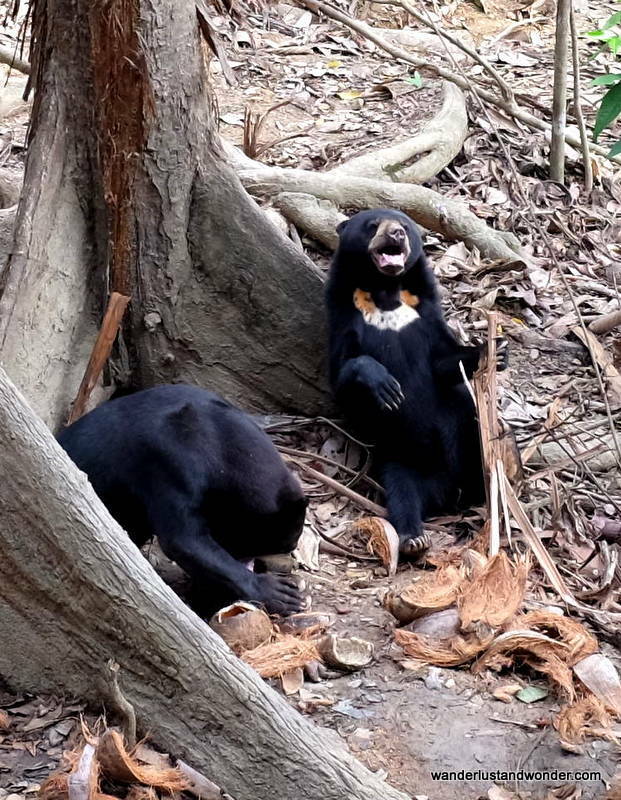 Here you can spot rescued sun bears lazing about and get an up-close view of rehabilitated orangutans. For the kids, seeing the outdoor nursery (the very one featured on the TV show Meet the Orangutans) where baby orangutans tease and play with each other was a highlight of the trip. 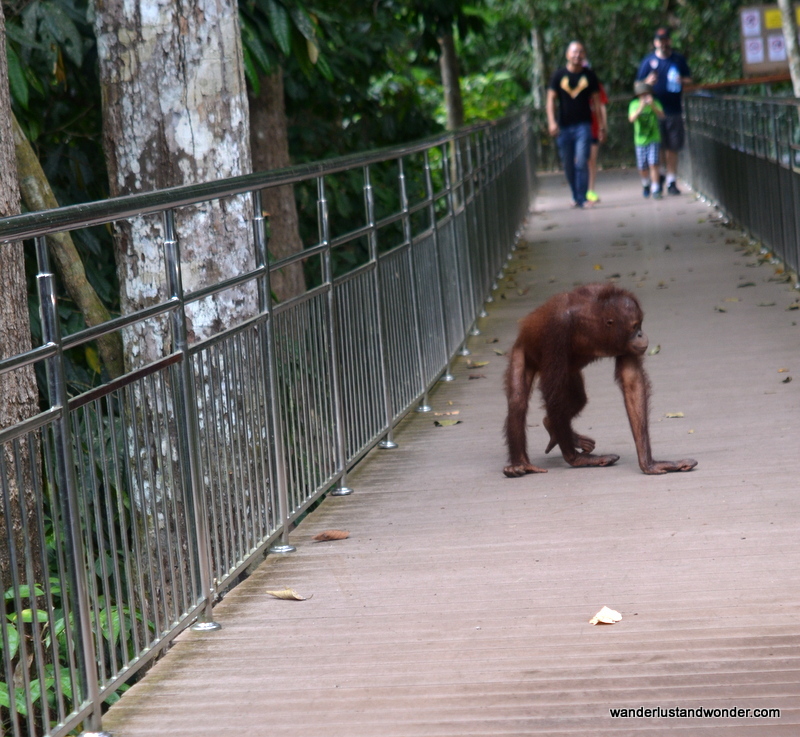 Orangutans roam freely around this center. While this is an amazing place, it is heartbreaking to remember that the very reason these animals need rescuing is due to humans destroying their habitat. Seeing these animals up-close really brought home how precious wildlife is, and how we need to take steps everyday to help remedy the destruction. 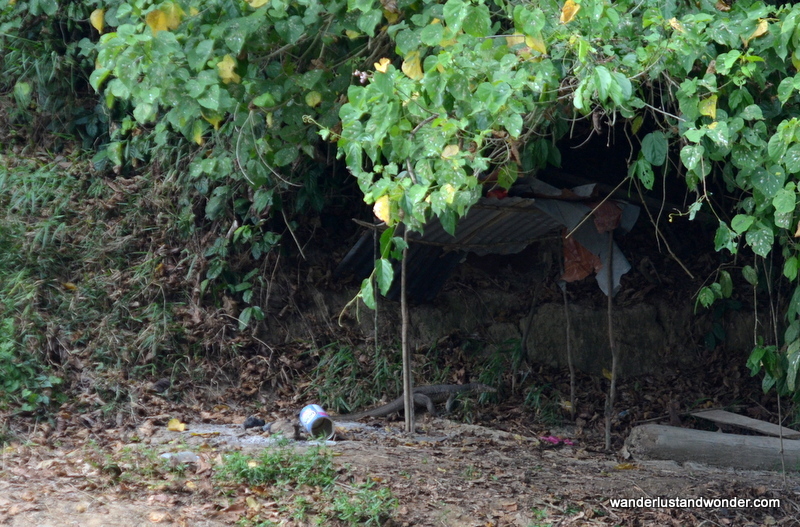 The next night we left the comfort of the B & B to head deep into the jungle to visit the Danau Girang Field Research Centre. It took about 2 hours by car followed by 40 minutes by boat to reach the centre, which is doing amazing work in the conservation of countless rainforest species. Accommodations here are a bit rough for city-dwellers like us, with shared showers and dorm-style rooms, no hot water, and extremely limited electricity (the generator is turned off at night, and runs for only a few hours during the day), BUT the experience was like no other. 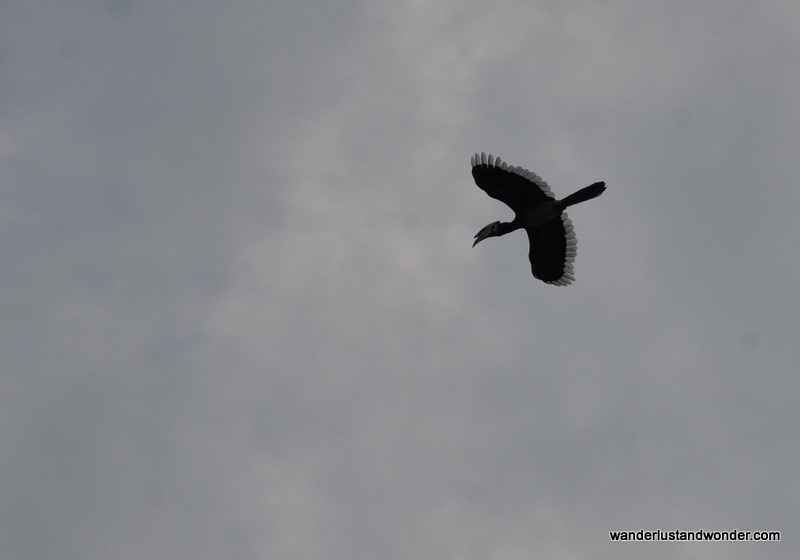 We took a boat ride along the river and spotted crocodiles, wild boars, hornbills, sea eagles, proboscis monkeys, long tailed macaques, silvery lutungs, to name a few. Then at night we took a hike through the rainforest to see beautiful birds sleeping on branches, a pit viper, a tarantula, frogs, scorpions, and many more wild creatures. The rainforest is a different place at night. 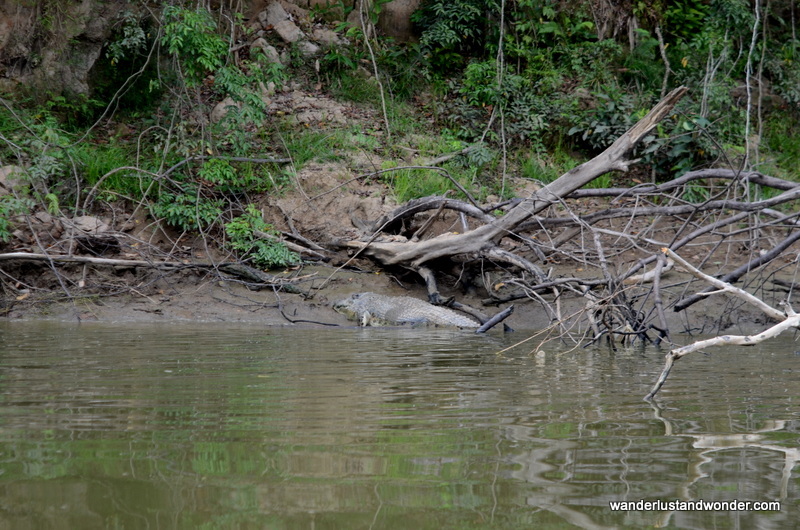 Our guides pointed out animals hidden in plain sight and were exceedingly patient with all of our questions. Vibrant and teeming with life, we navigated the darkness with headlamps firmly in place. Experiencing this wild landscape in a completely new way was an unforgettable experience. 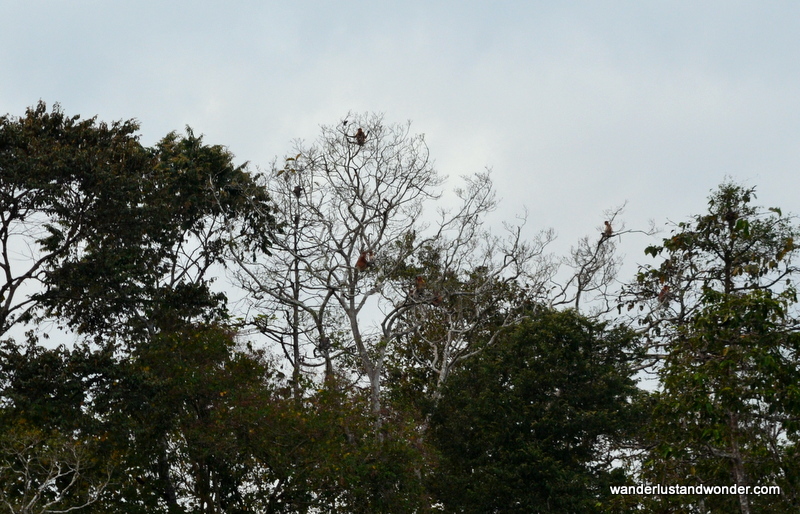 As we left Danau Girang we spotted a wild orangutan in the trees above us. 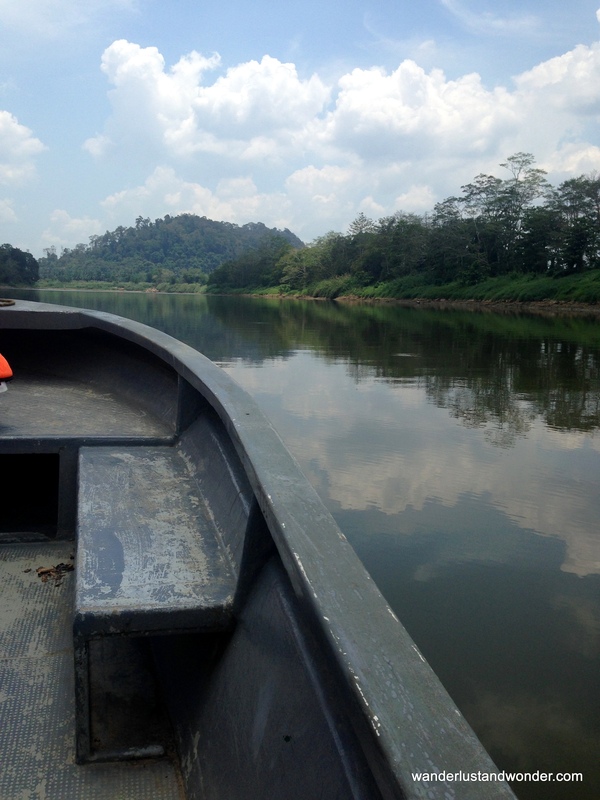 After our incredible night at Danau Girang, we headed back to Sepilok for the remainder of our time in Sandakan. The food at Lindung Gallery Restaurant was incredible. 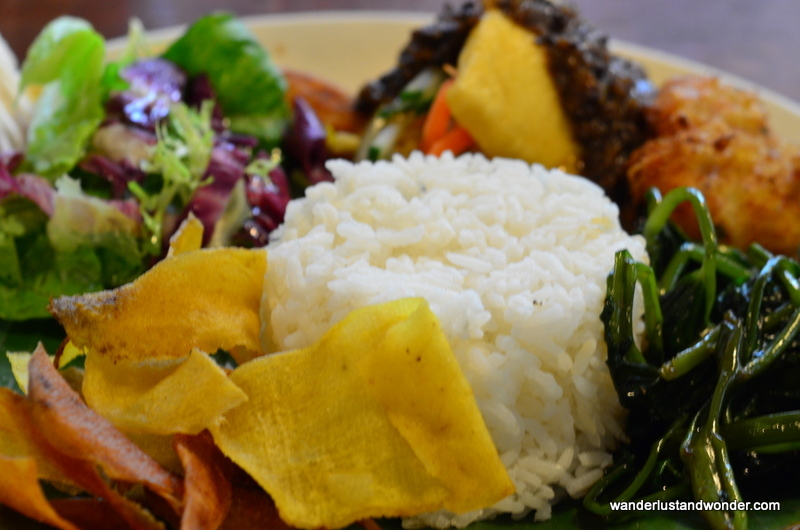 The food and atmosphere at Lindung Gallery Restaurant was so good we visited twice during our stay. The five of us are vegans/vegetarians while our accompanying friends are not, but we all found something to love on the menu. 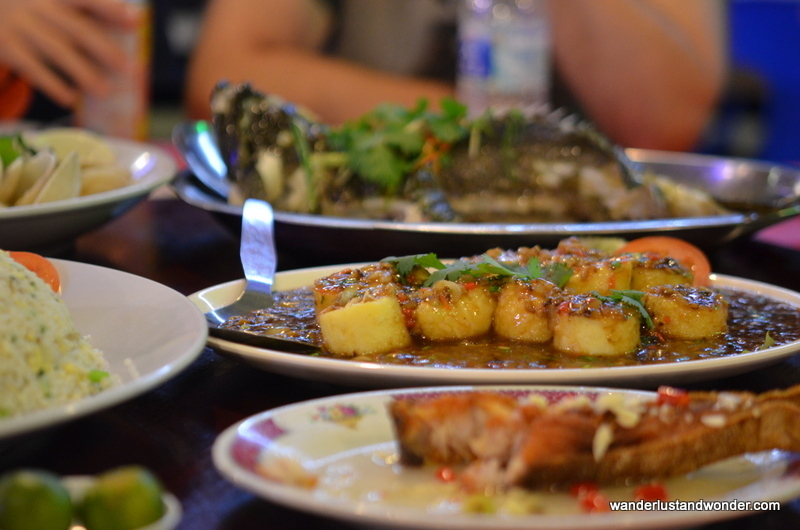 Sandakan is famous for its seafood, so for our friends the trip would not be complete without a visit to a local seafood place. Sim Sim Village offered delicious vegetarian options while also satisfying our friends’ cravings. 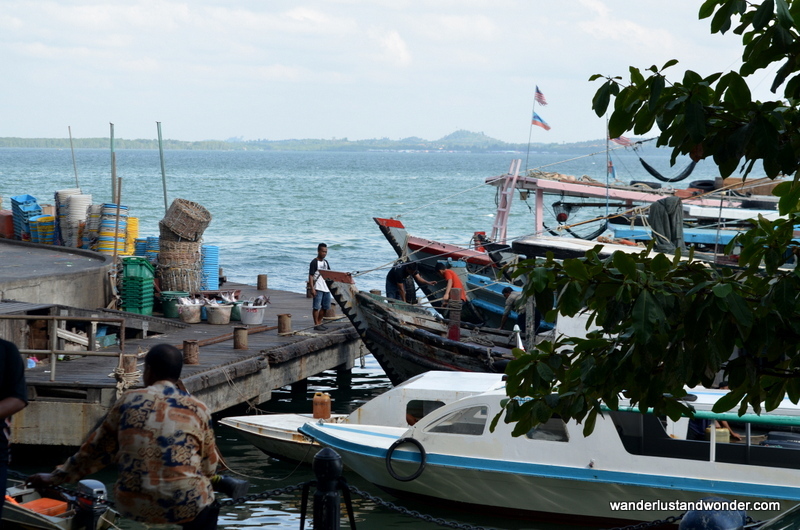 Set in a water village, this open air restaurant is a great place to relax and enjoy the sunset. Another excellent spot enjoy a great meal and beautiful view is the Balin Rooftop Bar & Bistro. Brought to you by the same folks behind Lindung Gallery Restaurant, this little place offers sumptuous desserts, creative cocktails, and a bird’s eye view of Sandakan. It’s definitely worth stopping in to treat yourself to something great. 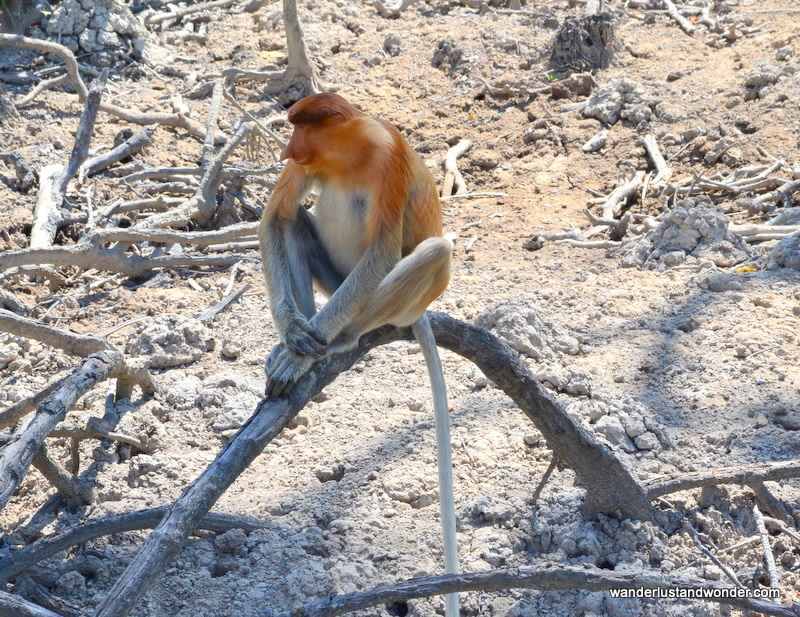 There are very few places in the world where you can see proboscis monkeys. Their dietary needs are so specific that they don’t fare well in captivity. 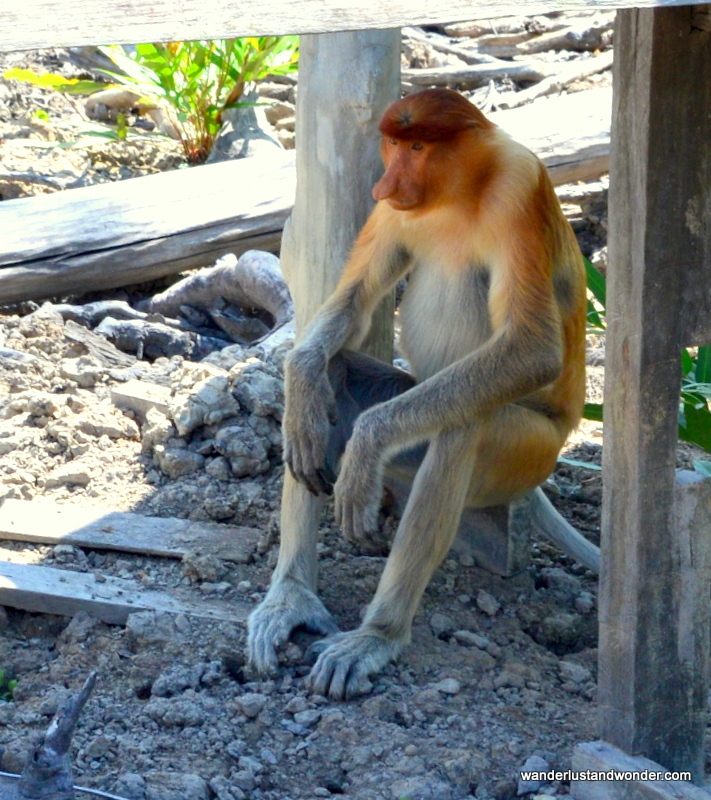 The Labuk Bay Proboscis Monkey Sanctuary feeds these wild monkeys twice a day on platforms such that onlookers can get a great view of these strange creatures. Proboscis monkeys have features so unique and mannerisms so human like, that they are fascinating to watch. 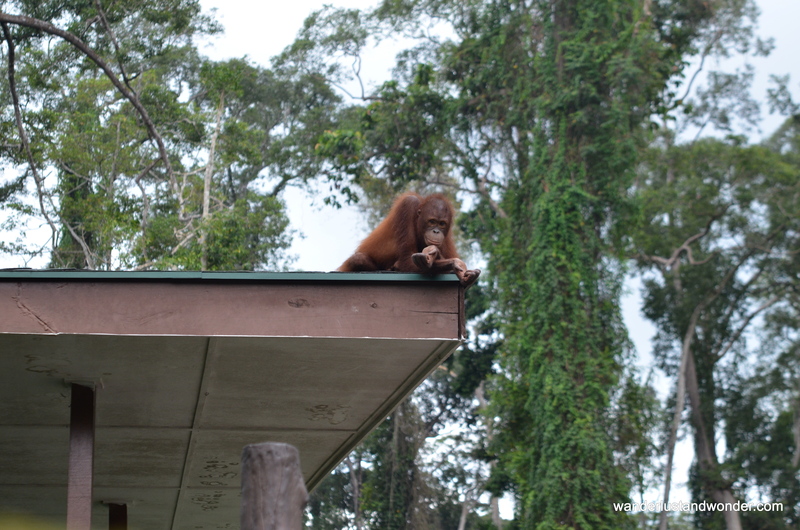 Don’t forget to bring sunscreen and a hat/umbrella as the feeding platforms are located within the grounds of a palm oil plantation and it can be quite a hot walk in the afternoon. 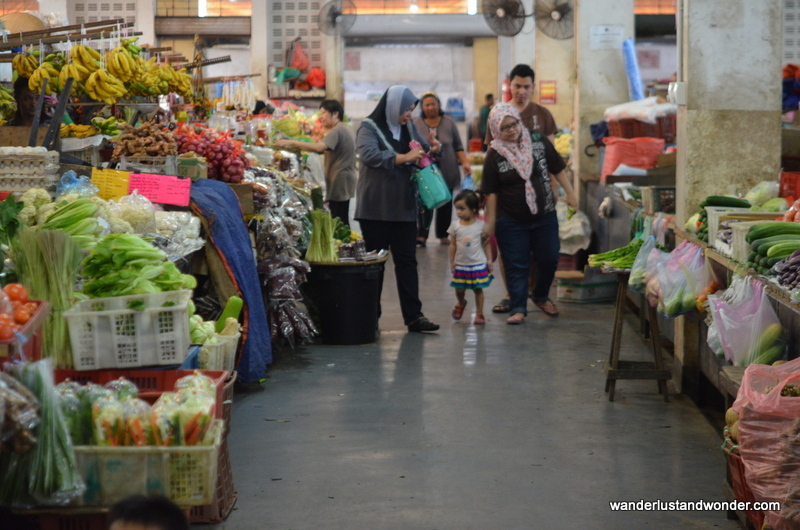 We headed to a local market to pick up some fresh fruit to enjoy. 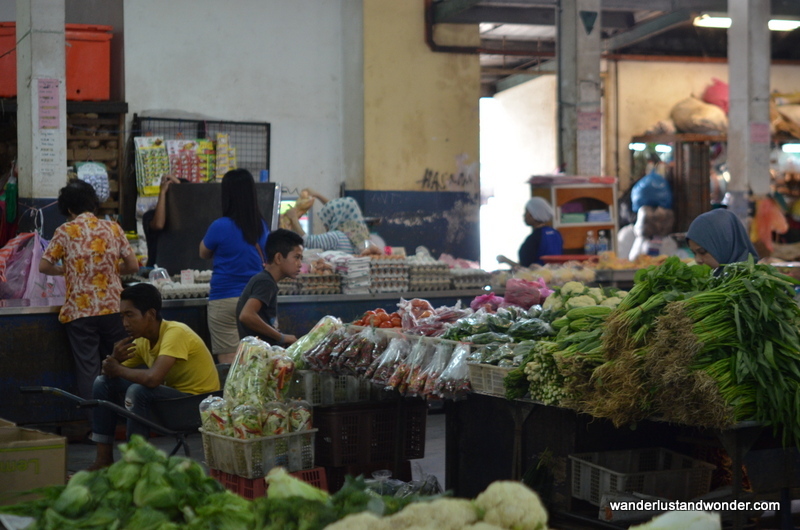 Much like the town itself, the market was a friendly and colorful place to spend some time. This kind lady asked me to take her picture. 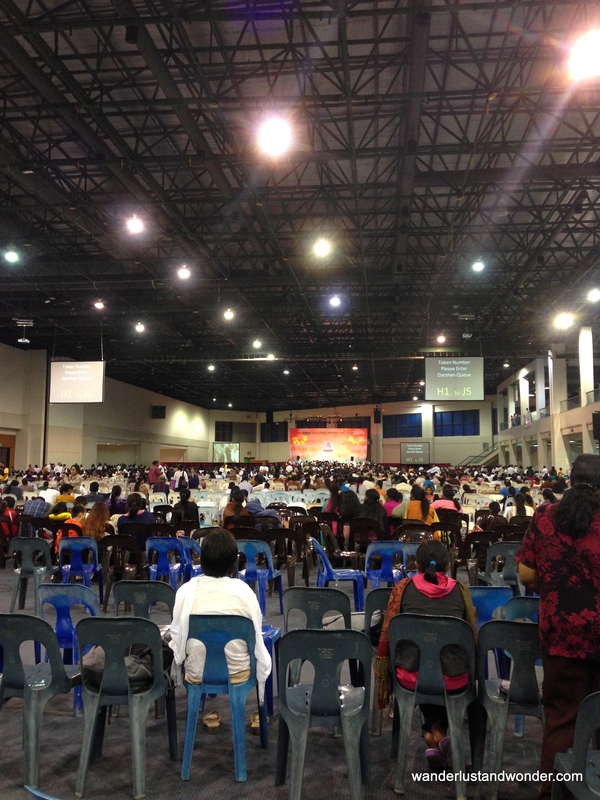 A trip to Sandakan was just what the doctor ordered. 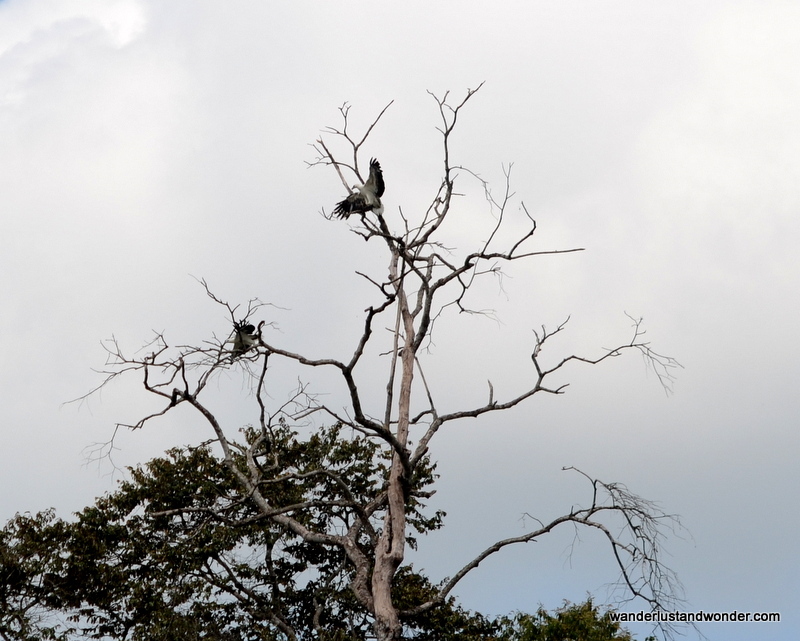 After being fully immersed in the sights and sounds of nature, we felt ready to once again face the urban landscape. If you get the chance I highly recommend visiting this engaging and wholly interesting town. 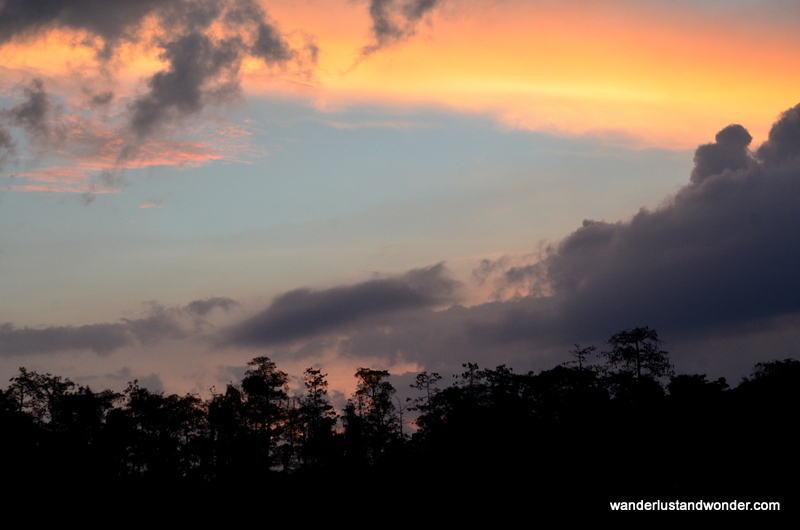 Whether your pleasure is food, bird watching, or nature walks, Sandakan will definitely leave you wishing you had a couple more days to spend in this enchanting place. 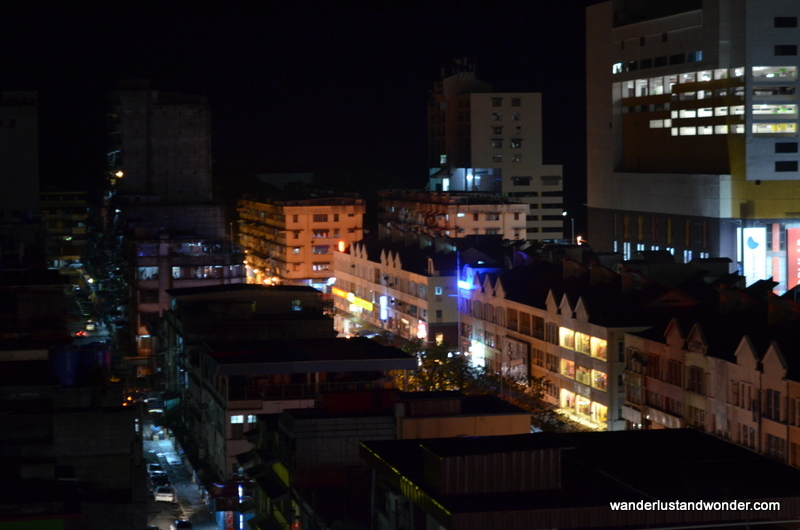 Sandakan was a refreshing adventure! 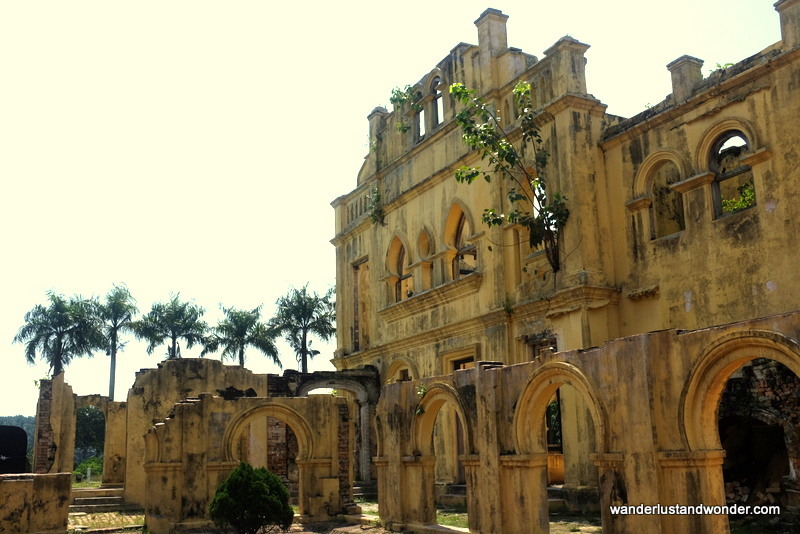 An easy getaway out of KL lies 2 hours north in the city of Ipoh. With beautiful limestone hills framing its horizon, the city is rich in both natural beauty and tangible history. Where else can one explore a castle, feed turtles in a secluded garden, peek inside a haunted house, wander around a ghost town, and spot clever street art? With aged walls and bricks and tiles imported from India, Kellie’s Castle is a truly unique place to spend some time. Built by the wealthy Scotsman William Kellie Smith in the early 1900’s, the home features many interesting rooms and tunnels. Though never completed (due to Kellie’s unexpected demise), Kellie intended for the structure to include an indoor tennis court and rooftop courtyard. 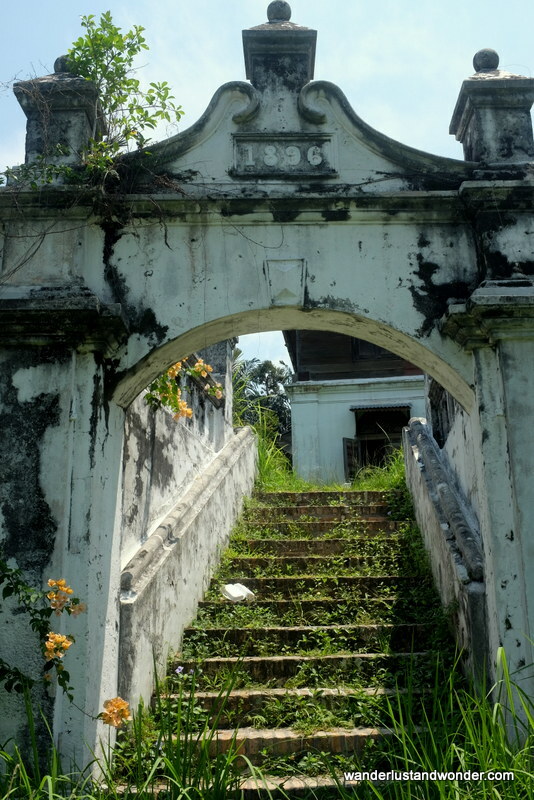 What remains today is the ideal place to take in Ipoh’s signiture vista of limestone hills while getting a history lesson along the way. 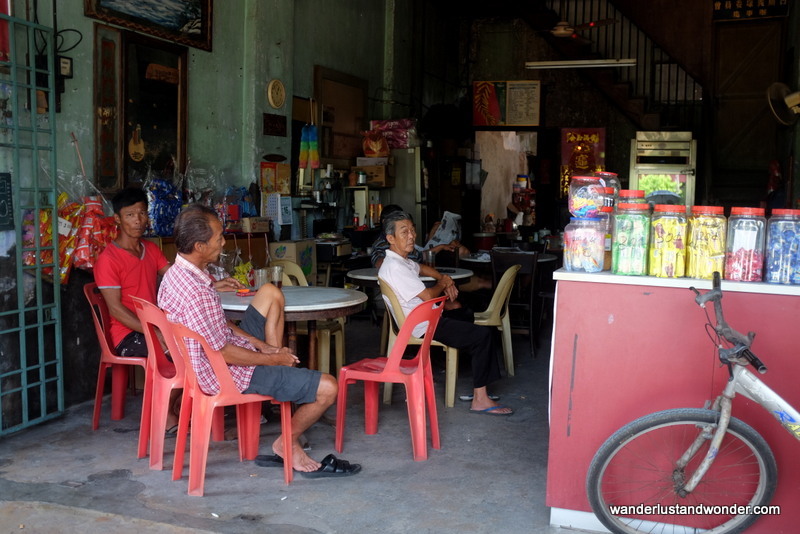 Papan, Perak is another place you must visit if you’re heading to Ipoh. 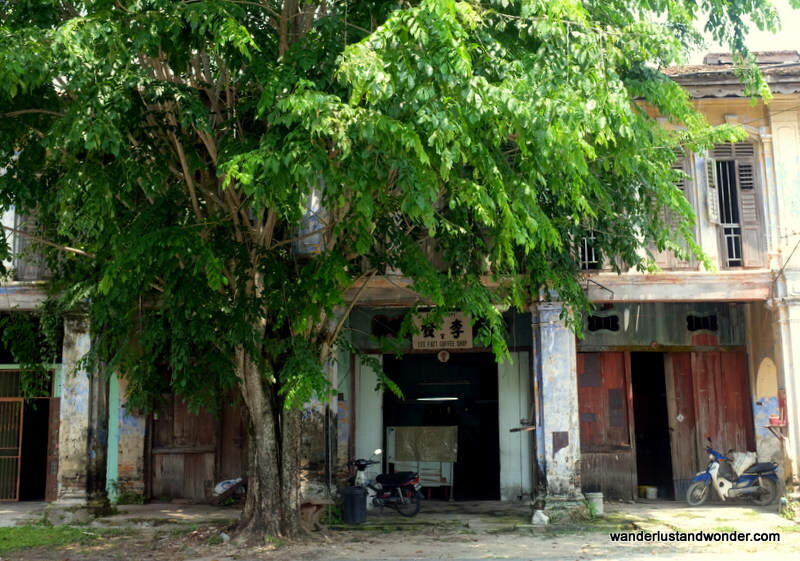 Referred to as a ghost town (though people still live here), this quiet neighborhood was once a vibrant tin mining town. 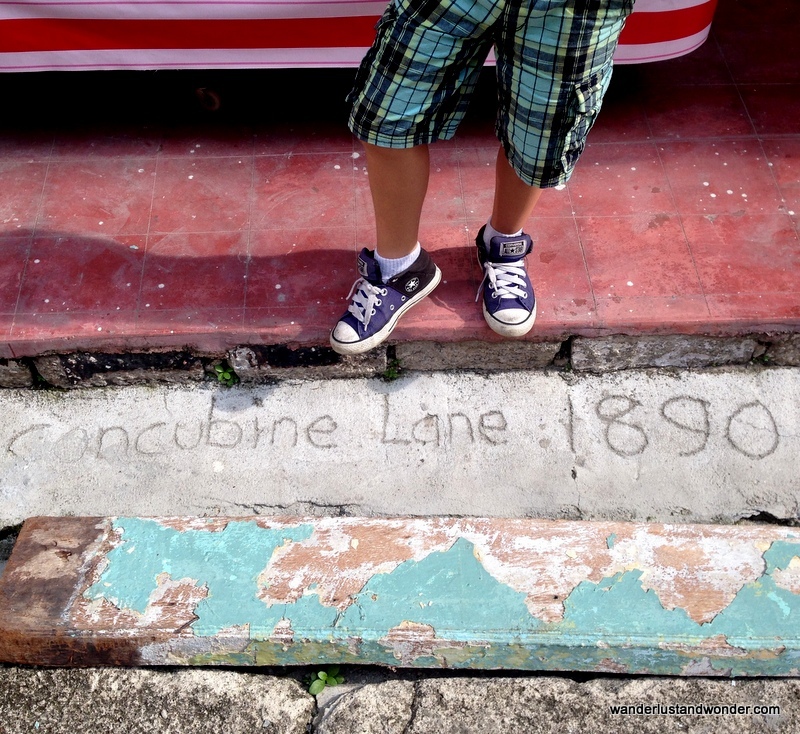 Visually captivating, the streets and alleyways present a sort of dilapidated time capsule. Sybil Kathigasu’s clinic still stands at 74 Main Road. 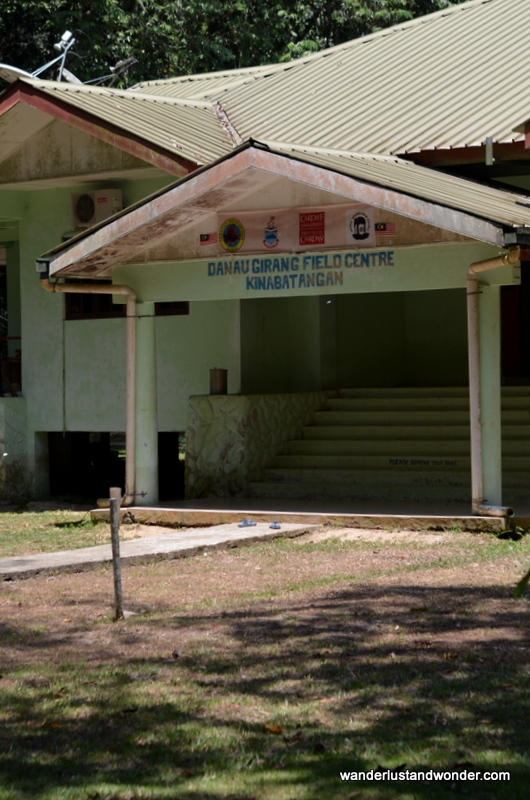 Papan was home to Sybil Kathigasu, Malaya’s war heroine, and incredibly you can still spot the clinic where she aided the resistance during the Japanese occupation. 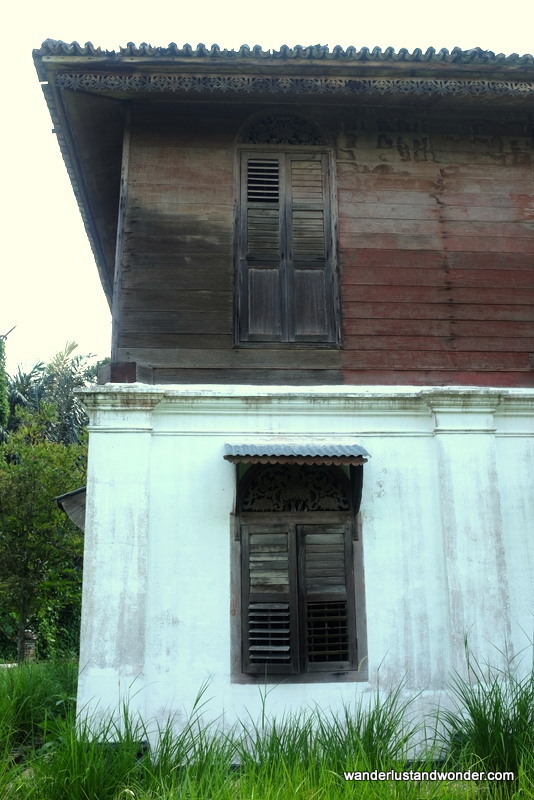 The facade of a mysterious and purportedly haunted house. What ghost town would be complete without an actual haunted house? 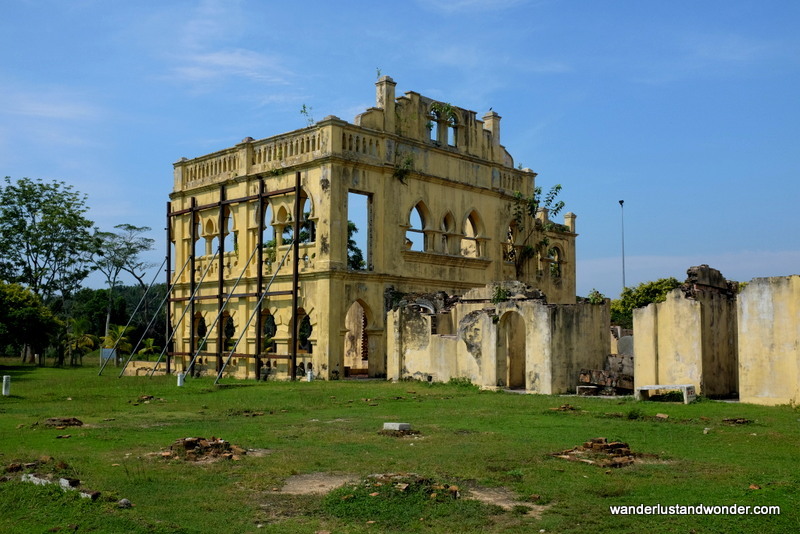 If you are brave enough you may venture off the main road to Istana Billah. Locals report that much paranormal activity takes place on the palace grounds, including the eerie sound of drums and call to prayer. Another scenic venue can be enjoyed at Sam Poh Tong Temple. 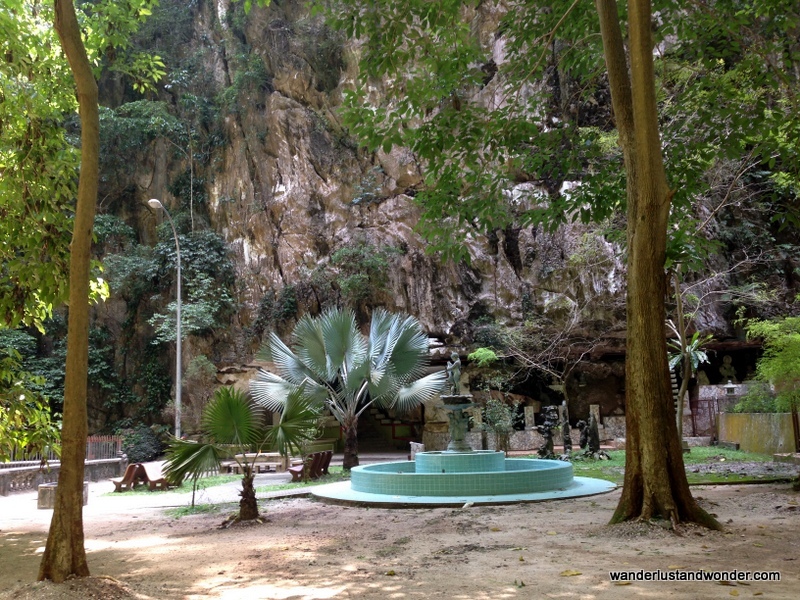 This Buddhist temple located 5km south of Ipoh is said to be the largest cave temple in the country. After walking though the limestone cave visitors will find a natural atrium. It’s an alluring site and thus easy to see why in 1890 a monk from China made the cave into his home and place for spiritual practice. The courtyard feels like a quiet oasis. 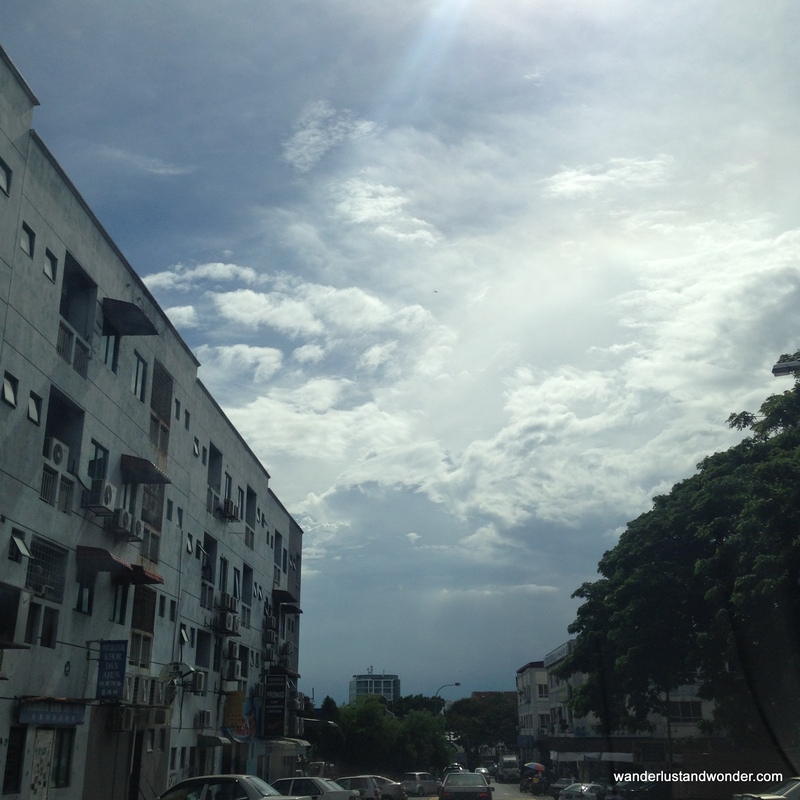 One of the things I love about Ipoh is how visually layered the landscapes are. 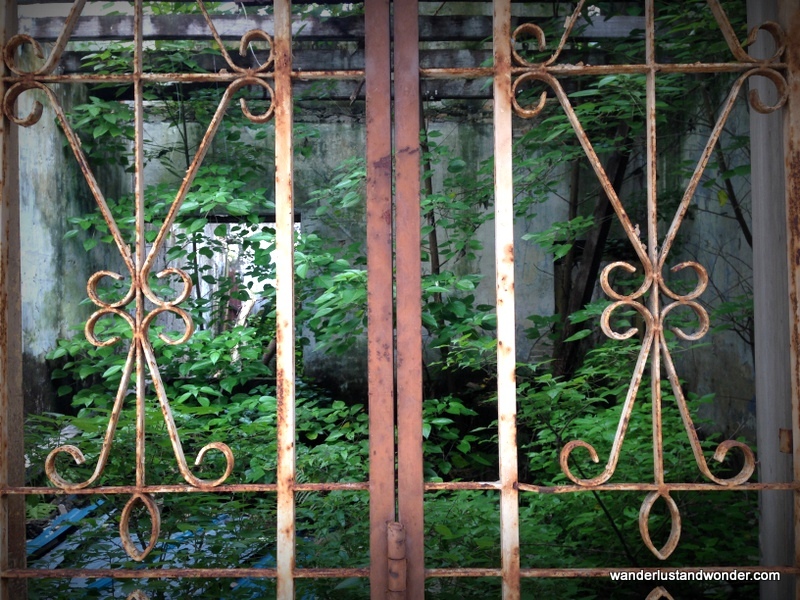 In Old Town Ipoh, you will find accidental gardens around every corner. 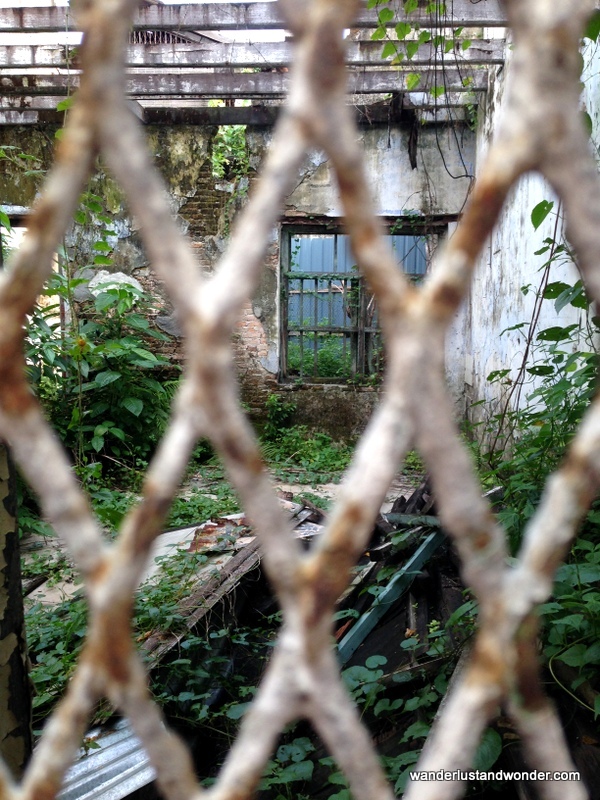 Secret Gardens abound in Old Town Ipoh. 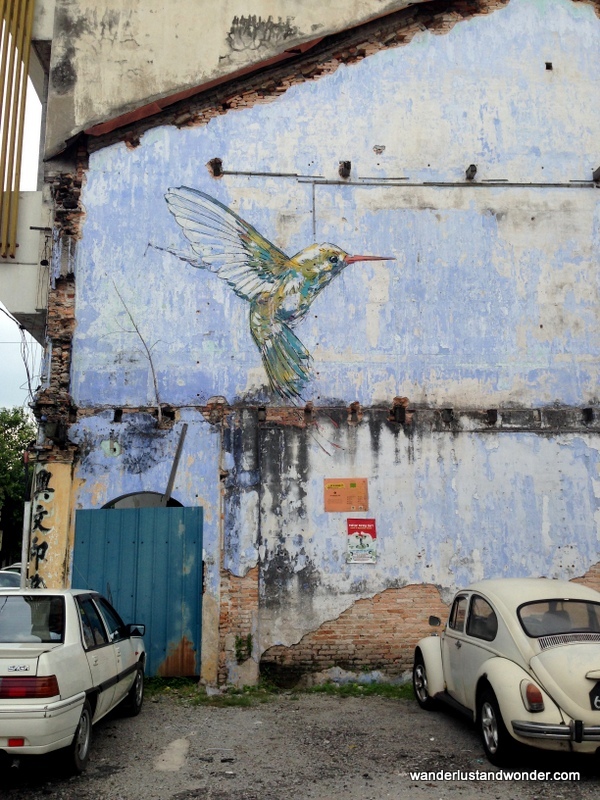 And, just like Penang, Ipoh too has inventive street art. Subtle street art at its best. 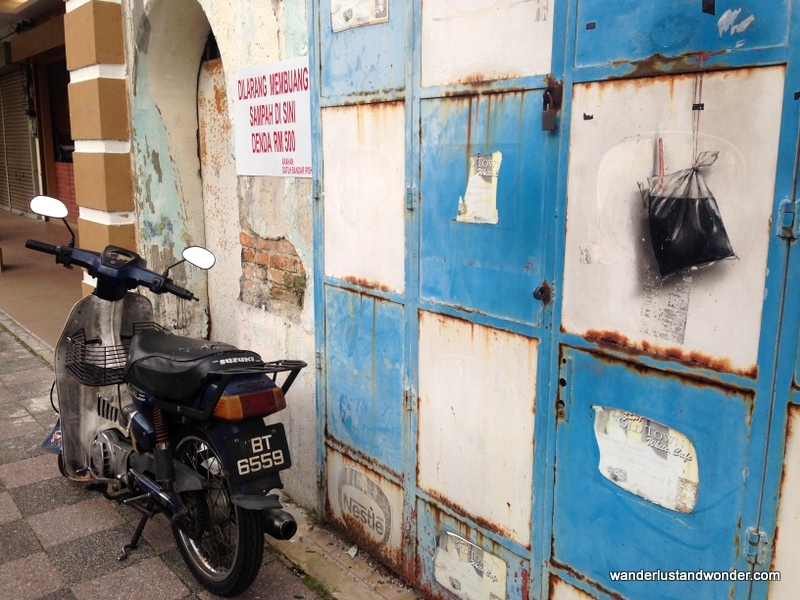 Ipoh is such a historically rich, naturally diverse, and culturally dynamic city, that it makes for the perfect quick sojourn out of Kuala Lumpur. Click here for a printable map of Old Town Ipoh. Happy exploring! It was a beautiful day to meet Amma. If someone offers you the chance to hug a Saint, you take it. That’s my advice anyway. 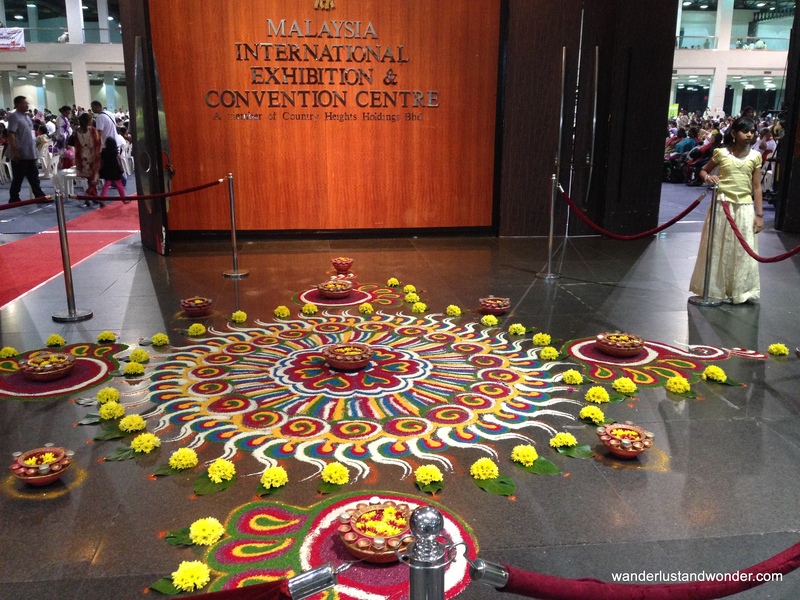 Thus, we arrived at the Malaysia International Exhibition & Convention Centre at 4:00 pm hoping to receive a token for a hug from Mata Amritanandamayi, better known as Amma, the hugging Saint. Magazine from the free event. 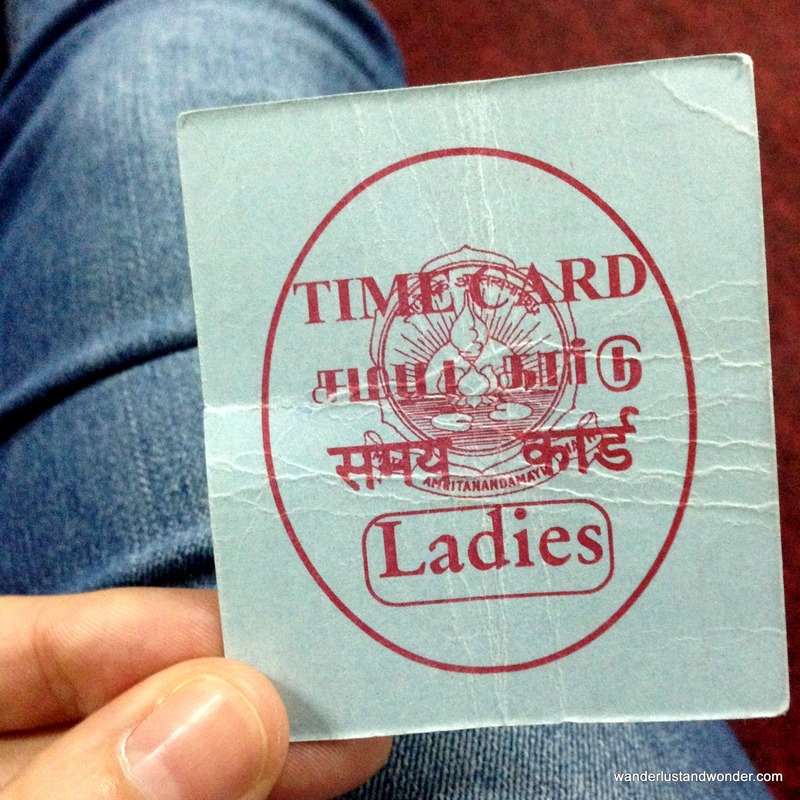 The first of two tokens received that night. When it comes to spiritual practice, I don’t pretend to know much. I try to proceed with an open mind and heart and leave the skepticism to others. Would her hug change my life? Certainly there is always room for improvement! The line to enter the Convention Centre was long, but calm. 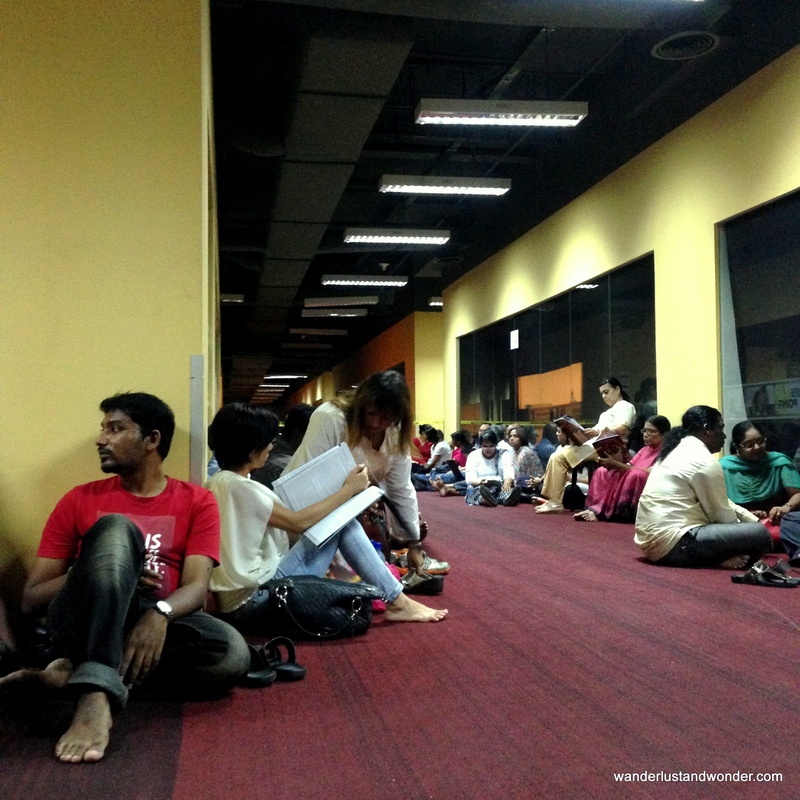 At 4:00 am it was my turn to approach the Guru. Shoes off, I nervously stepped up to her. 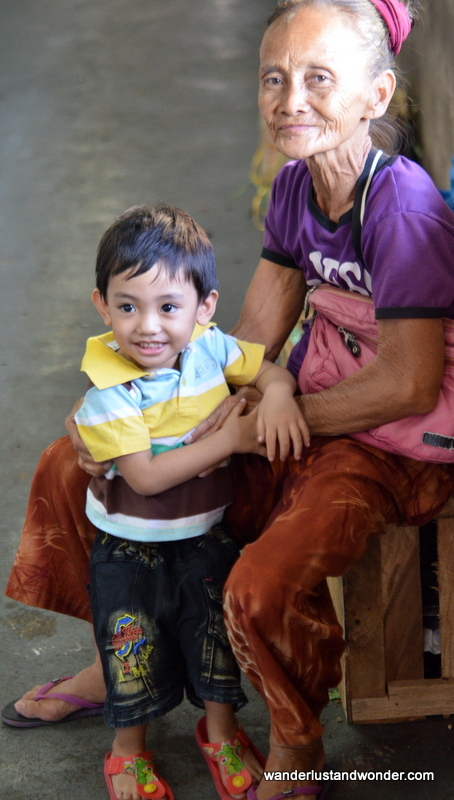 Her volunteers pushed me forward and placed my arms around her. The process has been filed down to an exact science, which was a relief as my nerves were beginning to get the best of me. In an instant I was in her arms. She lovingly held me and whispered something in my left ear. I couldn’t understand what exactly she said, but then she turned and whispered something in English in my other ear. I looked up and met her eyes. She looked incredibly kind. I would have loved to have said something profound or meaningful to her but all I managed to say was, “Thank you” before stepping down the ramp. Her words touched me. And I will carry them in my heart forever. Am I a changed person? I think so. Sometimes when we think we need a push to move us forward, a hug will do the trick. 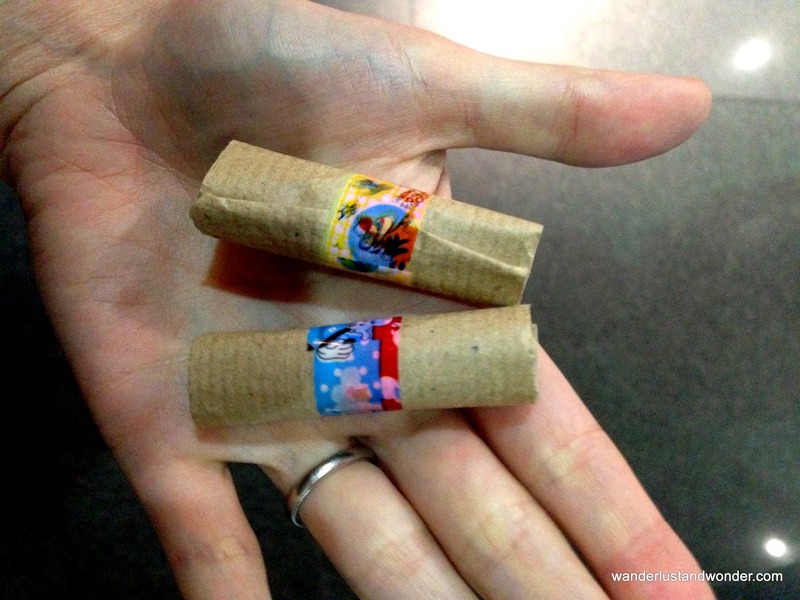 These two little packets (containing a candy and vermilion powder) were pressed into my palm as I left Amma’s embrace.